Difficulty Notes: This trip involves a lot of height gain and distance from the parking lot. Travel through a broken Robson Glacier involves crossing snow bridges and exposure to several ice falls and avalanche slopes. Potentially severe avalanche exposure on the summit slopes in winter conditions. As I lay in my truck at the Kinney Lake parking lot I could hear the Robson River gurgling cheerfully behind me. 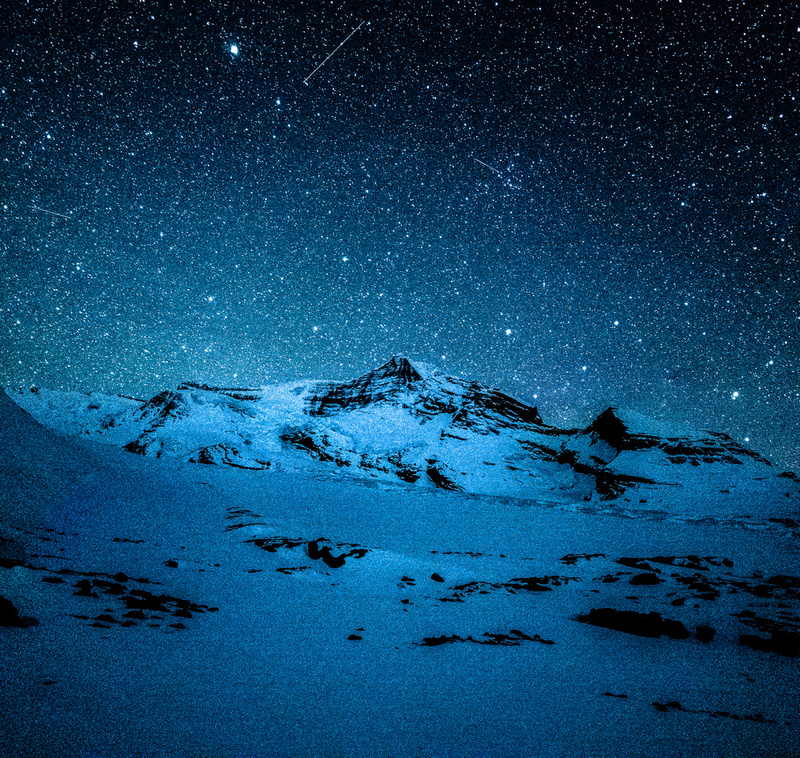 I could see a million stars starting to come out high above me and there were even some birds chirping their final evening songs just outside my window. My trip had already started out on a good note. 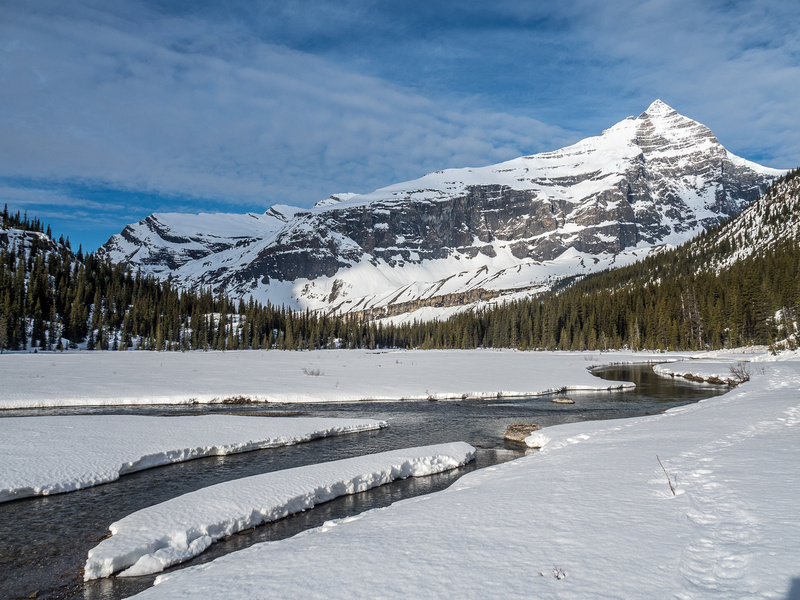 On the long drive from Calgary I was cruising past the North Saskatchewan River flats near Mount Amery, when I noticed some movement in the far distance across the Athabasca River. It looked like a large cat! I stopped the truck and took out the longest telephoto lens I had with me – only 300mm unfortunately. (I left the 600mm at home which is the last time I do that.) I spent the next 5 minutes playing stare-off with a very large (almost certainly a male) Canadian Lynx! It’s the first and only time I’ve seen one in the wild. What a beautiful and graceful creature! Seeing that large cat stalking along the river like it owned the place felt like a very good omen for my upcoming trip. I had no idea Lynx could get that large. Without the tell tale tufts on the ears I would have thought it was a bobcat or cougar by its size. Eventually the cat disappeared into the forest and I continued my drive north. This wasn’t my first time planning a trip to the Berg Lake area. In the fall of 2013 I did a wonderful solo trip there. 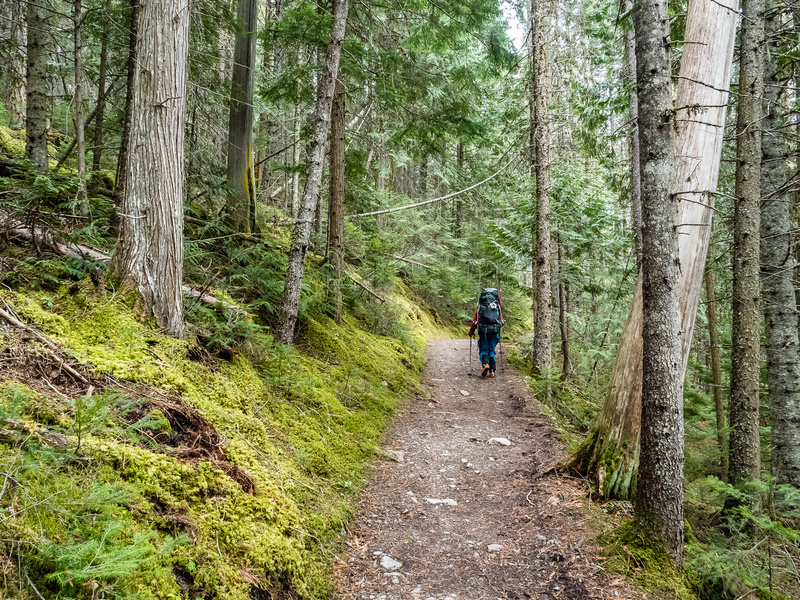 I scrambled two peaks, Titkana and Mumm Peak and hiked a few popular trails including Snowbird Pass, Mumm Basin and Toboggan Falls. Because it was late fall I pretty much had the area to myself, which made it a very top quality trip – probably a top 10 for me. 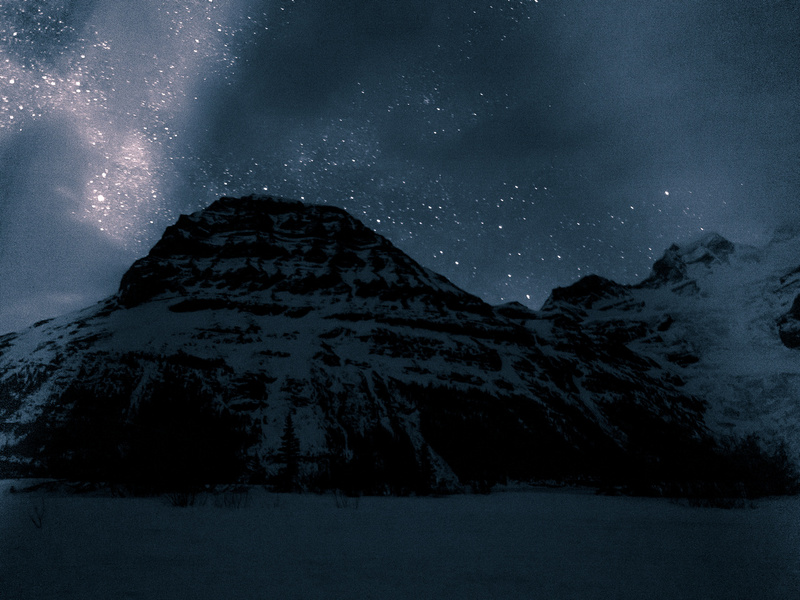 I have a large photo of Mount Robson with the Milky Way hanging on my wall and the view of it never gets old. This time would be a bit different. Instead of going in the late off-season, we were going in the early off-season. 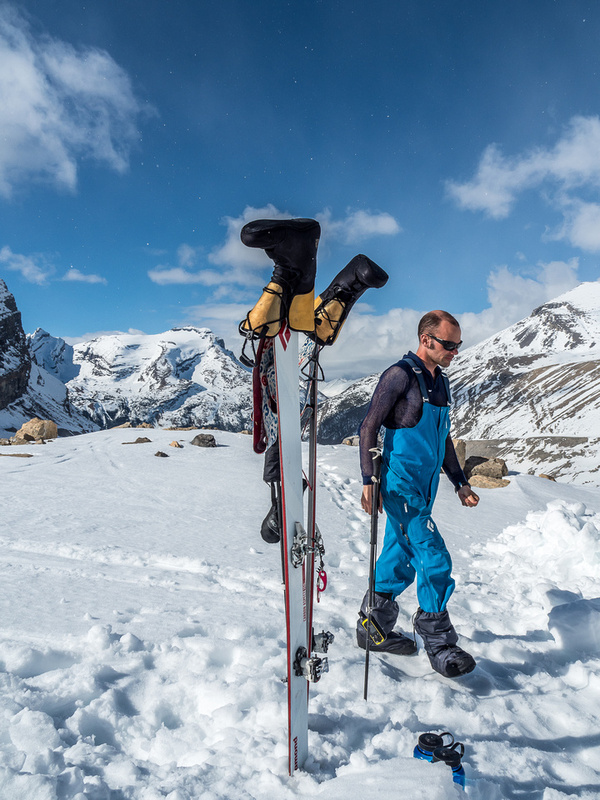 And instead of hikes and scrambles we were planning a fairly serious ski mountaineering objective – the 3426m summit of Mount Resplendent. Resplendent has been on my radar for years already. 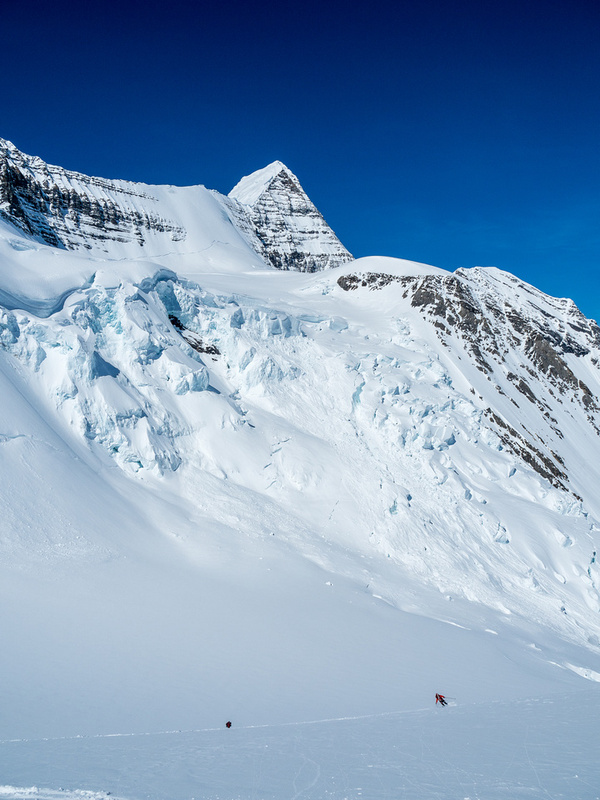 I knew it could be a ski objective in the right conditions and considering who it’s neighbor is, I also knew it would have incredible views of the mighty Mount Robson – the highest peak in the Rockies, looming over 500 meters higher than Resplendent at 3954m! Named by Arthur P. Coleman A.O. Wheeler wrote, “On the east side it is clad from top to bottom in pure white snow, and presents with the sun shining upon it a spectacle of such wonderful brilliance that the aptness of the name became immediately apparent. Official name. First ascended in 1911 by B. Harmon, guided by Conrad Kain. Our trip was planned for Fri Apr 8 to Mon Apr 11. With one day on either end for approach and egress, this would hopefully give us two days for Resplendent if needed. As a further risk mitigation, we were planning a winter camp under Extinguisher Tower to move our base of attack about 500m higher and over 7km closer to Resplendent. We were also planning on attempting Rearguard Peak if we got the chance – since we were in the area anyway. Darn peak baggers… 😉 Eventually Ben and Mike drove in beside me and we all hunkered down for a few hours of restless sleep in our vehicles. It didn’t help that some small creature decided to use my truck roof as a race track all night! Even banging on the roof didn’t help. I seem to attract rodents while bivying. What’s up with that? We forgot to communicate which time zone we were using on this trip, so Ben was up at 05:30 AB time while my phone switched to BC time on me. We ended up rising at 06:30 AB time. Oh well. 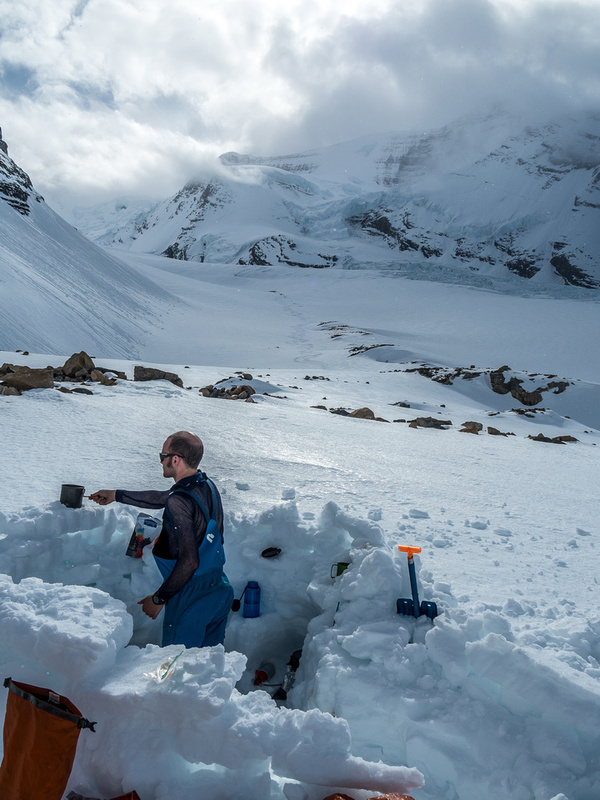 We ‘only’ had to go the 18km and around 1100m vertical to the Hargreaves Shelter at Berg Lake and we had tons of daylight to do it in. 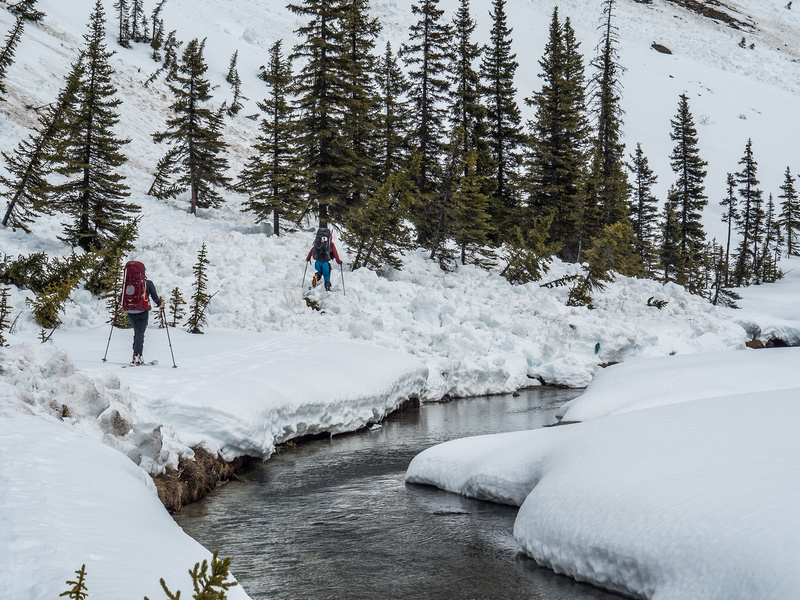 We started from the parking lot with our skis strapped to our packs. It is always interesting when you start a ski trip with the snow sticks on the pack and ski boots on the feet! After almost 2km we finally switched to ‘skiing’. Make no mistake. This was spring approach skiing at its finest. 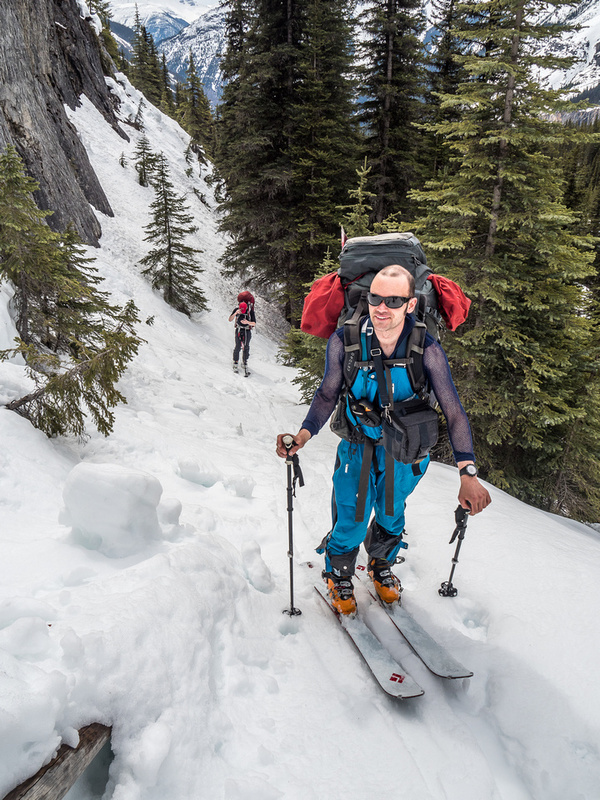 It included the ‘low snow’ classics such as bushwhacking with skis, skinning through mud puddles and my personal favorite – skinning across tens of meters of scree, gravel and muddy ice between far flung snow patches that kept beckoning us on with their siren calls that promised solid snow just ahead. Mike was a bit shocked at the abuse Ben and I were dishing our gear and I’m pretty sure he started questioning our sanity on stretches of bare road where we just kept tramping on stubbornly refusing to take the skis off! 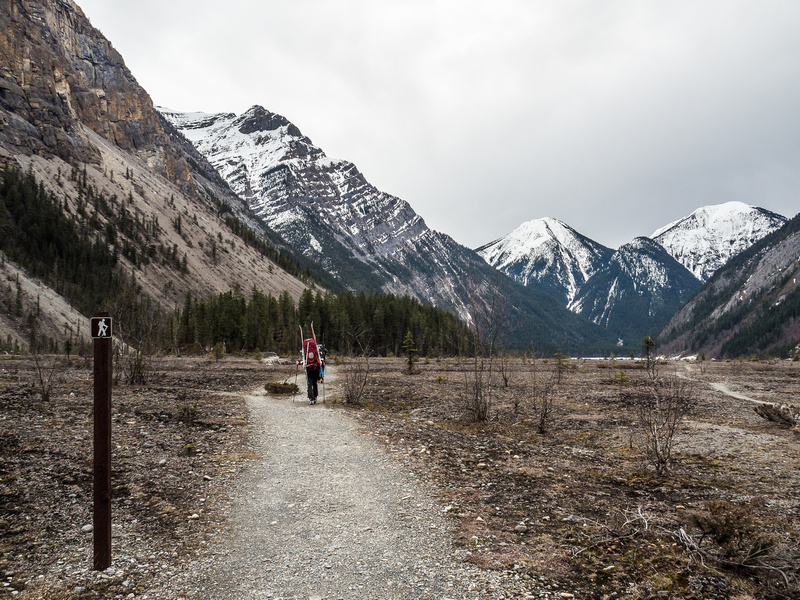 Ben hikes the wide trail to Kinney Lake as we get our first views of Resplendent Mountain at upper right. Robson at left, obviously. 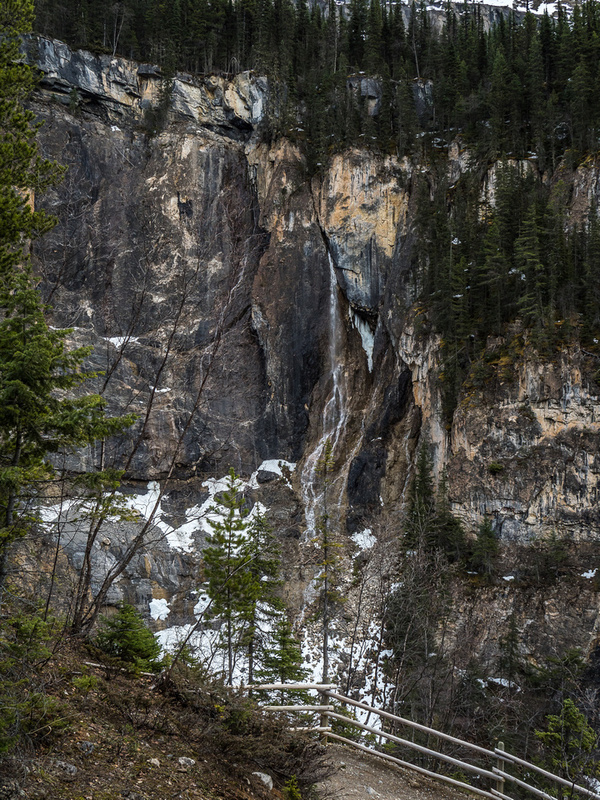 When we got to Kinney Lake the snow situation deteriorated even further. The lake ice was way too sketchy to ski across so we had to hike the annoying summer trail up and around it. But there was NO snow here! Not even a patch or two to tempt us. 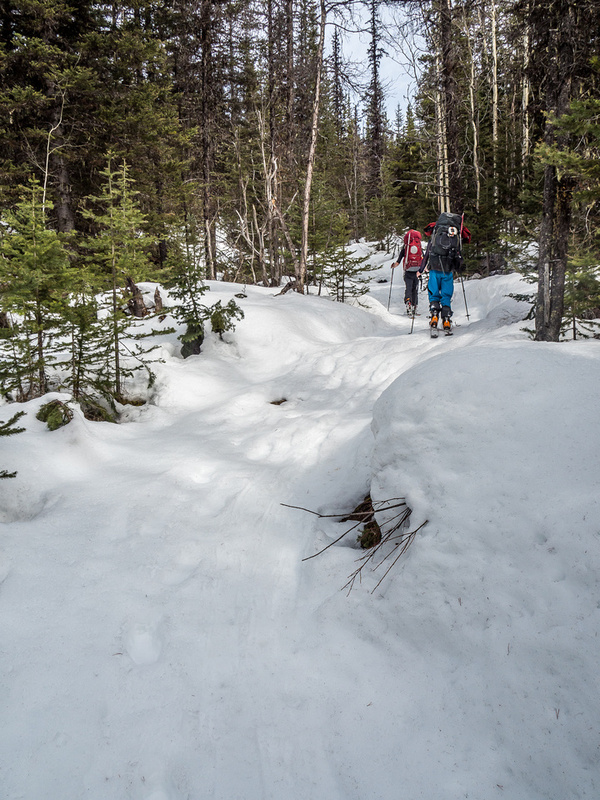 The skis went back on the packs for the trudge around Kinney Lake and well beyond the lake up the Whitehorn Hill towards the Whitehorn campground. The hill is south facing and was completely melted bare. At least the views kept us entertained – especially trying to scope out the various approach options for Whitehorn Mountain, another 11000er in the area that we’re interested in. Ben really wants to keep the snow sticks on! 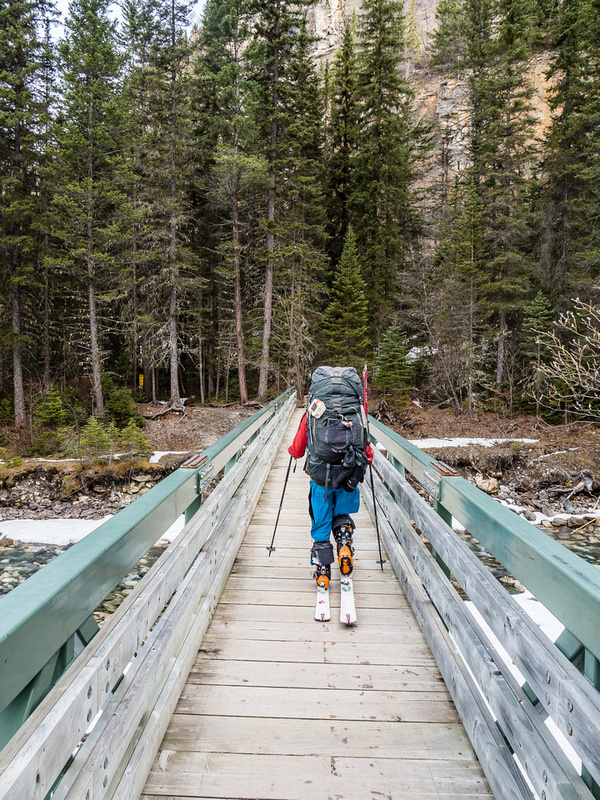 Across the cable bridge near the Whitehorn campground and ranger station, we finally attached the skis back onto our feet where they belonged and started skinning towards the Emperor Hill below the Valley of a Thousand Falls. Sorry to rant here for a second but it has to be said that I was a wee bit disappointed my first time through here. 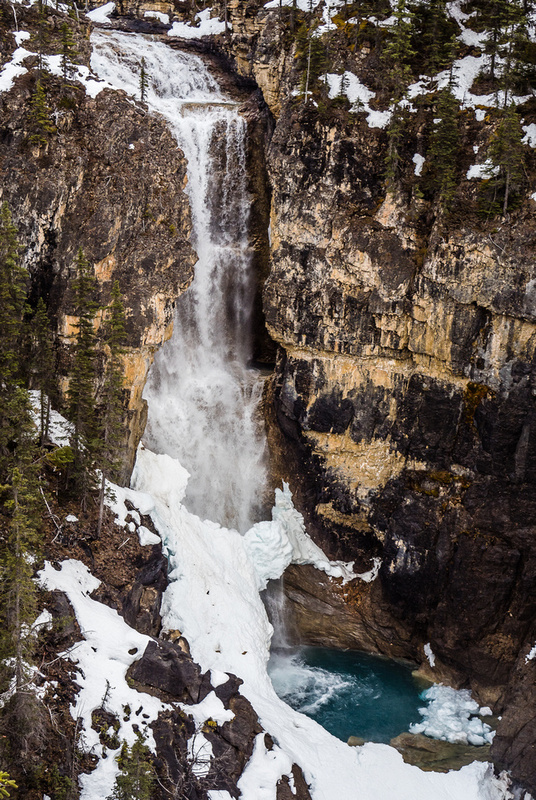 Sure – the scenery is mind blowing and there’s some gorgeous waterfall action but a THOUSAND falls? Not even close. It should be called the “Valley of Four Falls and 15 Trickles of Water” or something like that. Talk about false advertising. 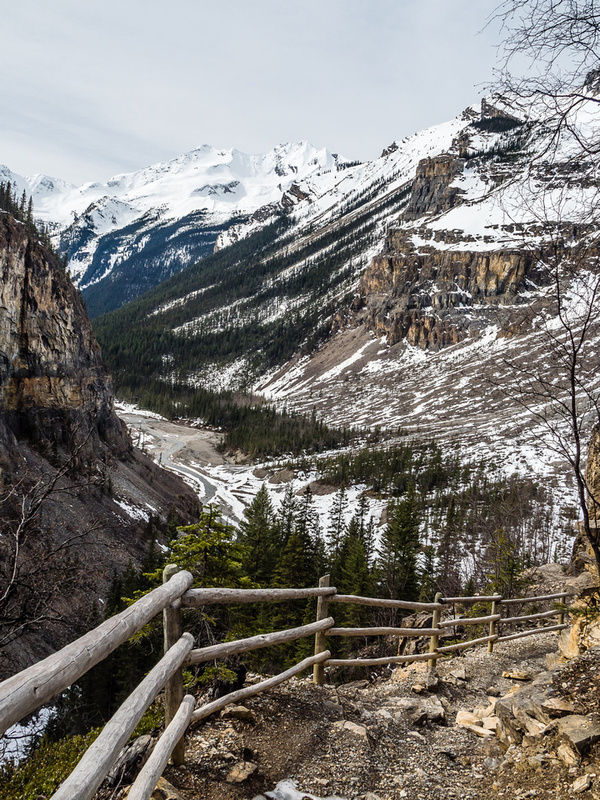 😉 That reminds me of another ridiculous name – the Canadian Mount Everest Trail near the Kananaskis Lakes area. Everest? Really? As we skinned towards the Emperor hill, Mike commented that it was looking pretty darn dry. Sure enough! We managed to skin up about a third of the hill before I was skinning on dry scree and the other guys were carrying their skis again! Eventually even I gave up and gave my poor skins a break. 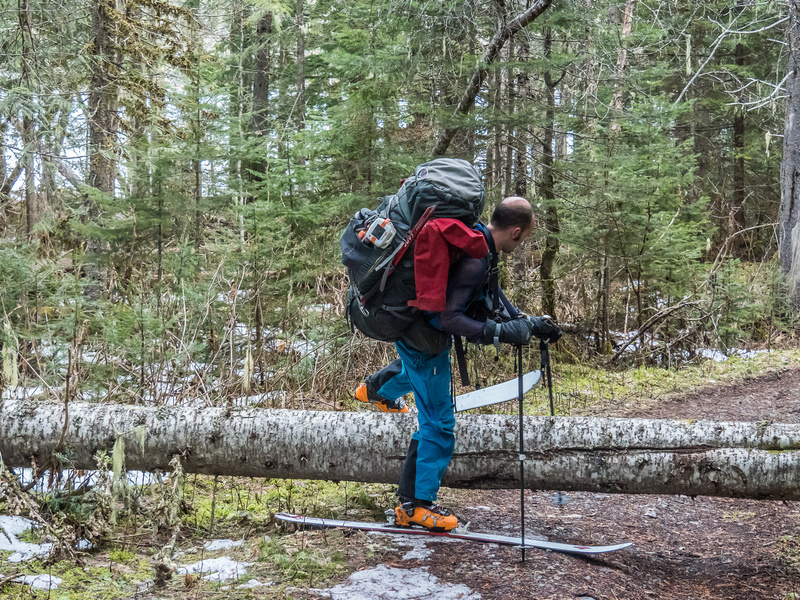 After White Falls when the trail took a sharp turn into thicker trees again we finally put our skis back on and left them on the rest of the approach. 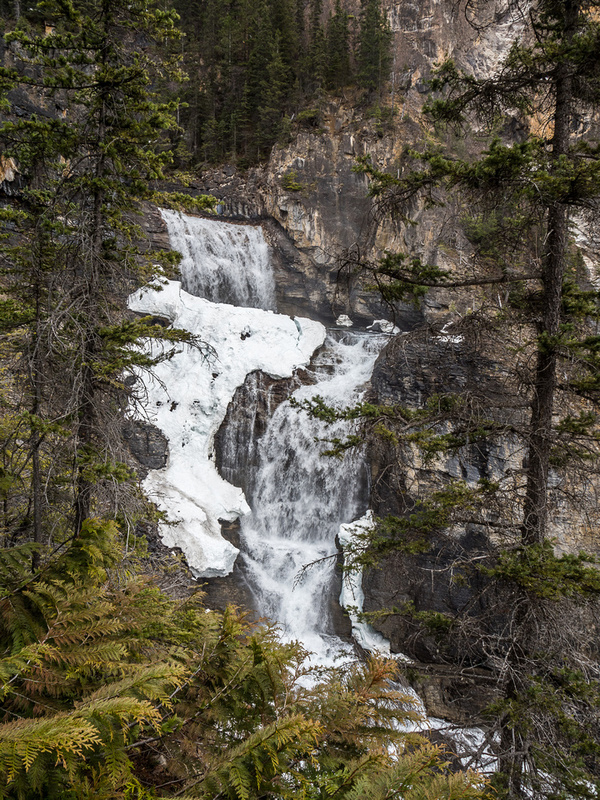 As we skinned up the interesting and scenic ridge beside Emperor Falls, Mike asked where the Emperor Falls were! He was expecting much more than the half frozen wimpy cascade that we were seeing I guess. I have to say – it’s much more impressive in the summer at full flow. 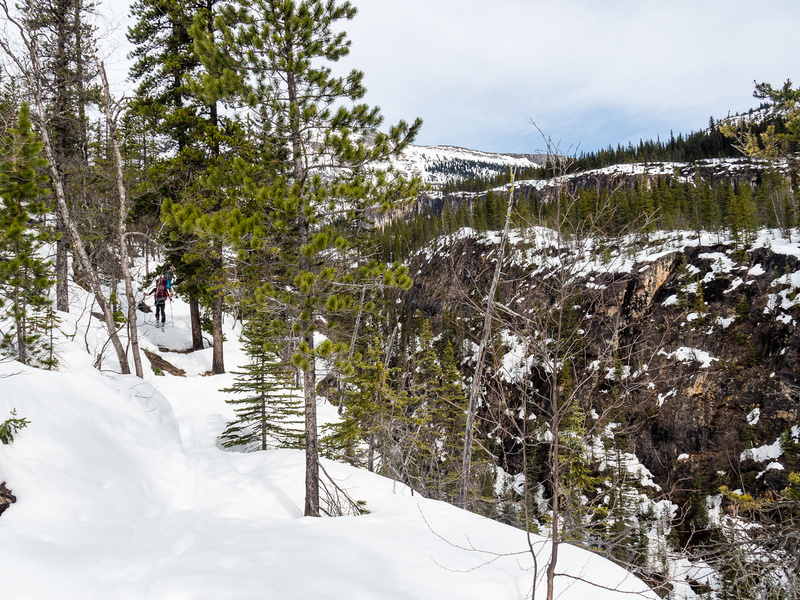 Ben skis up a narrow switchback on the trail above me while Mike completes his morning yoga session on the bridge at left. 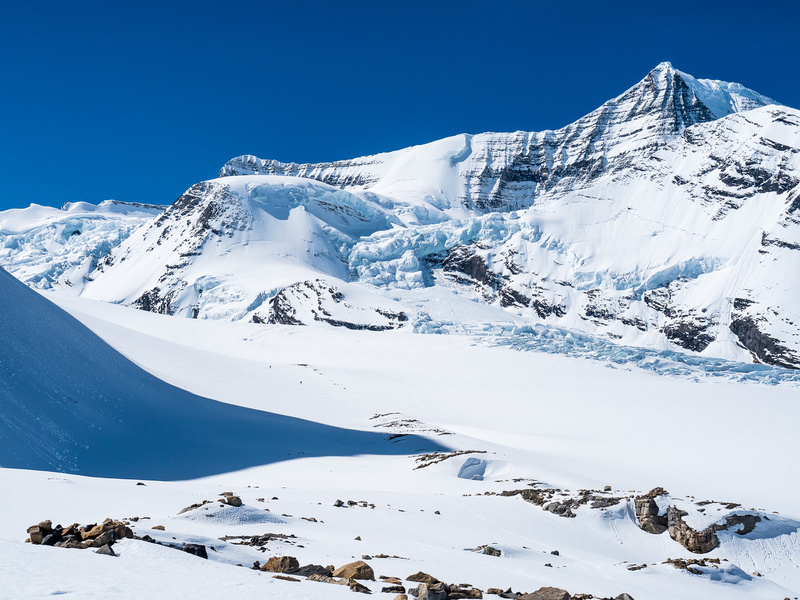 The slog from the Emperor Falls view point turn off to Berg Lake was just as usual – much longer than you’d think. Thankfully the snow was pretty good and held our weight thanks to the skis. Snowshoes or boots would have sucked big time along this final stretch, as the snow pack was collapsing in the strong spring sun. We stopped for a break at the Emperor campground beneath the enormous and scary Emperor Ridge on Mount Robson. 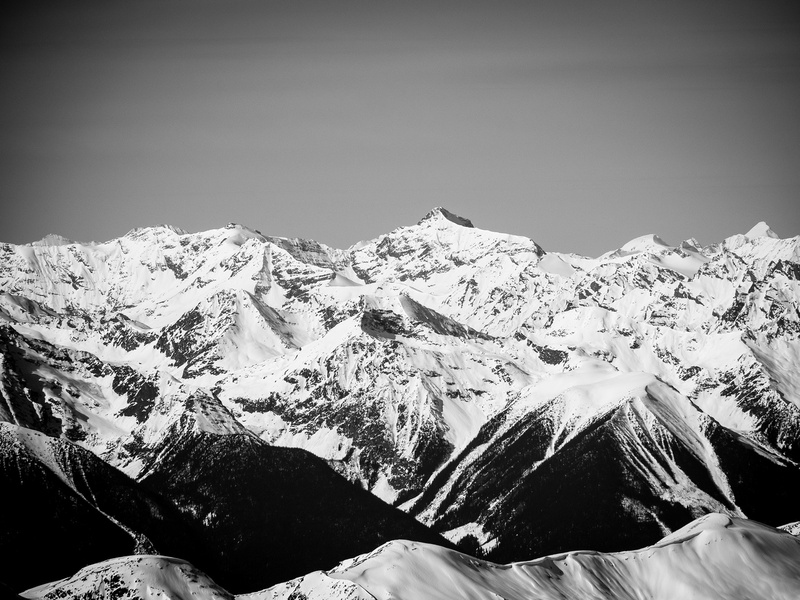 The sight of the ridge in winter conditions was enough to render me speechless. I’m not going to lie – anyone who looks at that route and thinks that it looks doable is far more of a climber than I’ll ever be. Far more. Respect. Because of the ridiculously warm weather we didn’t trust Berg Lake enough to risk skiing across it. We reluctantly went left and skirted the lake on the regular summer trail. Not a huge deal, but not nearly as flat as the lake would have been either… The sight of the shelter was welcome and after 8.5 hours we could finally dry our gear and make a comfortable camp. We even managed to scrounge for dead fall and make a cheery, warm fire in the Hargreaves Shelter. A delightful way to spend the evening! 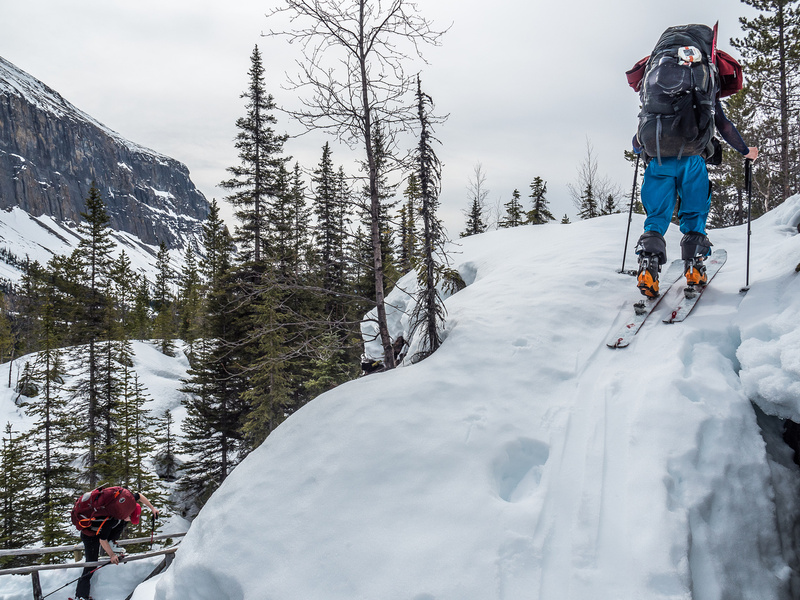 Robson’s Emperor Ridge towers above us as we navigate the river flats before Berg Lake. 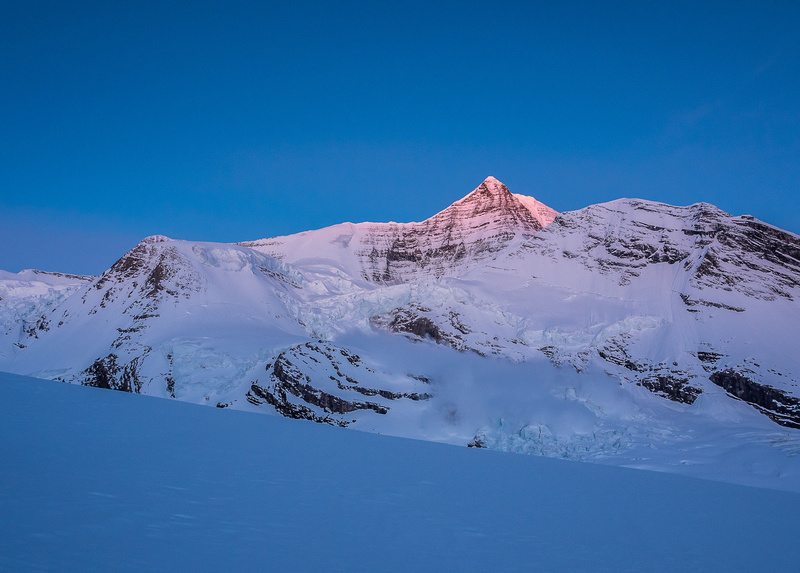 We prepared for setting up a winter camp under Extinguisher Tower the following day and decided we should get up around 0300 in case Resplendent was in shape. Given our updated forecast which was calling for 80% cloud cover on Resplendent for Saturday, we weren’t very encouraged but you never know in the mountains. 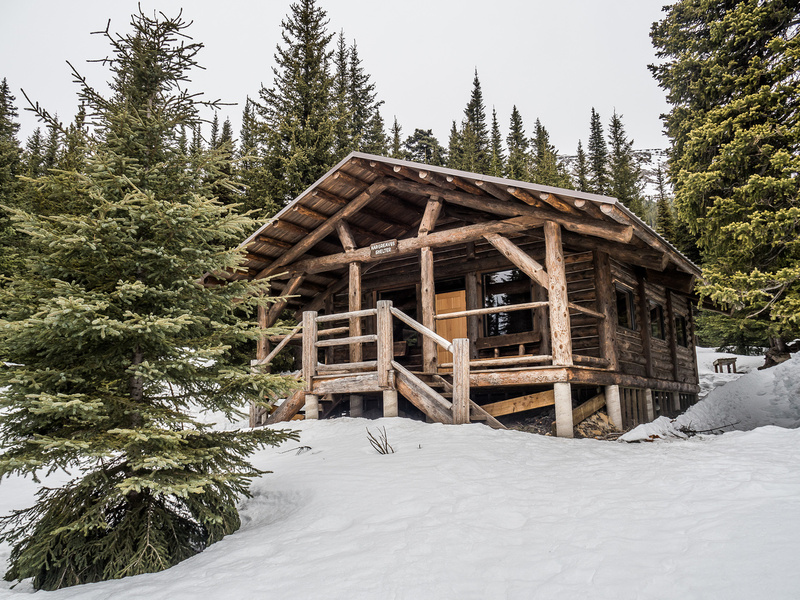 Just as we were falling asleep a group of snowshoers from Edmonton came stumbling into the hut! They assured us that they had destroyed the skin track (!!) and would try to be quiet. Yeah right… The next two hours were frustrating as I couldn’t fall asleep with the head lamps and noise. I don’t blame the group though – such are the joys of shared accommodation. 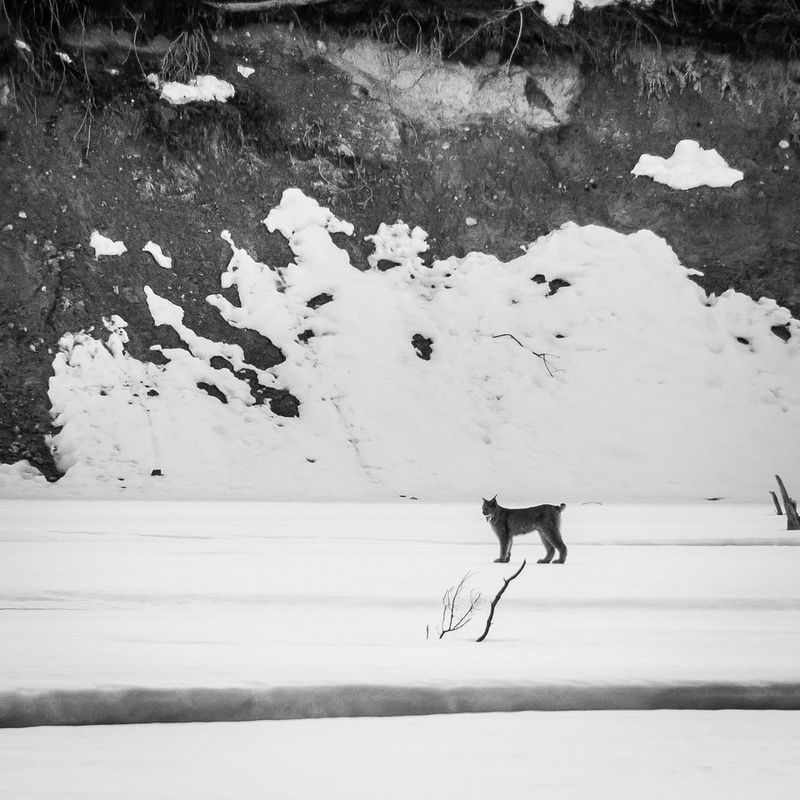 A large Canadian Lynx watches me from across the North Saskatchewan River. A gorgeous evening drive up hwy 93, this is from a rest stop above the Big Bend, looking back south. Cirrus at left. 'Skiing' beside the Robson River. 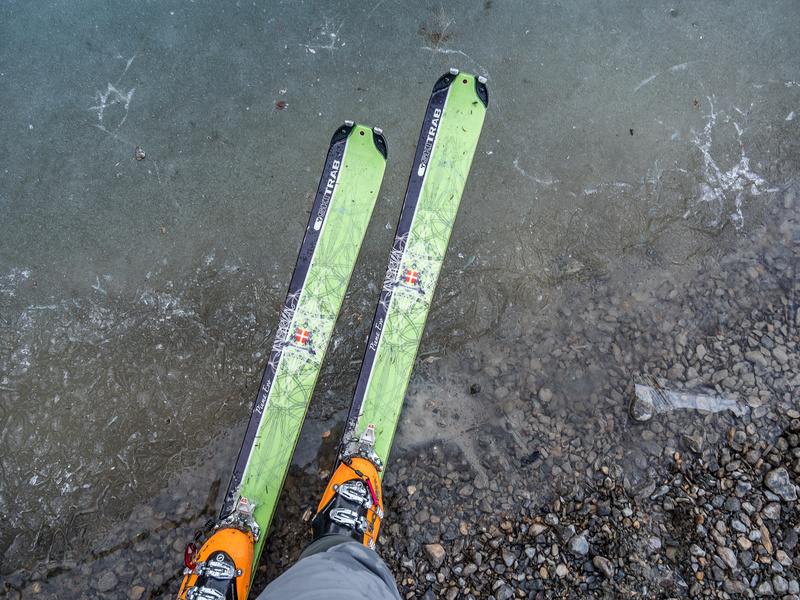 Maybe skinning across Kinney Lake isn't a great idea. Maybe if we go fast enough? Reluctantly hiking with the skis on our packs again, around Kinney Lake. Mike grunts his way up a VERY dry Whitehorn Hill. 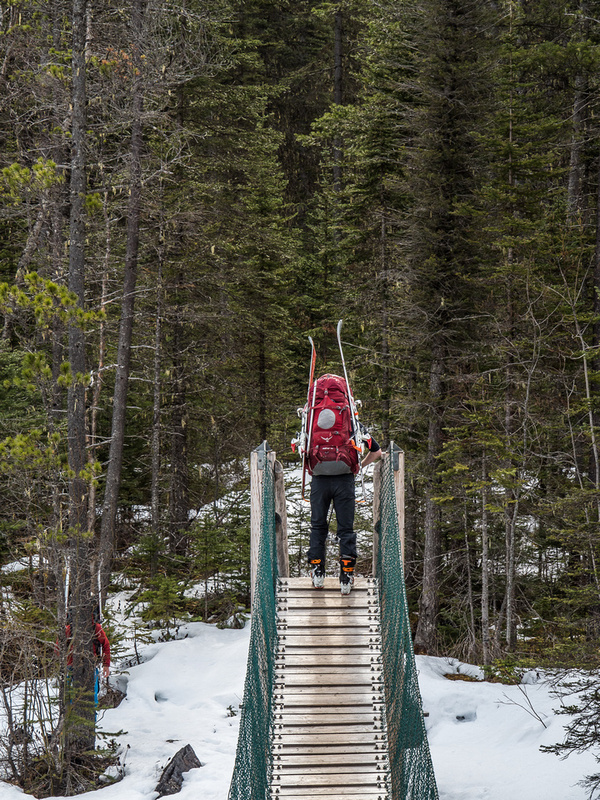 Crossing the cable bridge over the Robson River, just before the Whitehorn campground. The skis are back on! Ben skins along the Robson River on route to the Emperor Hill just ahead to the right. 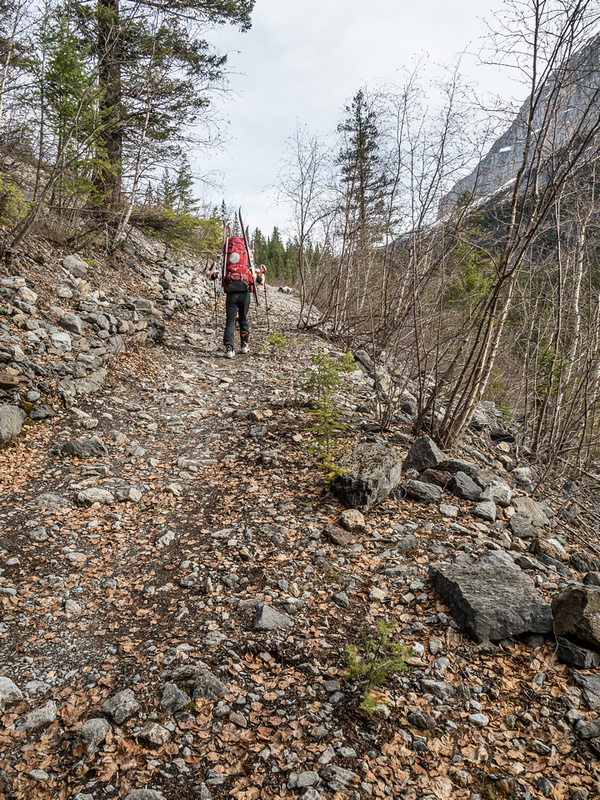 One of my favorite sections of the approach to Berg Lake is this section of trail up the Emperor Hill. Above the Emperor Hill we finally put the skis back on for the remainder of the approach. 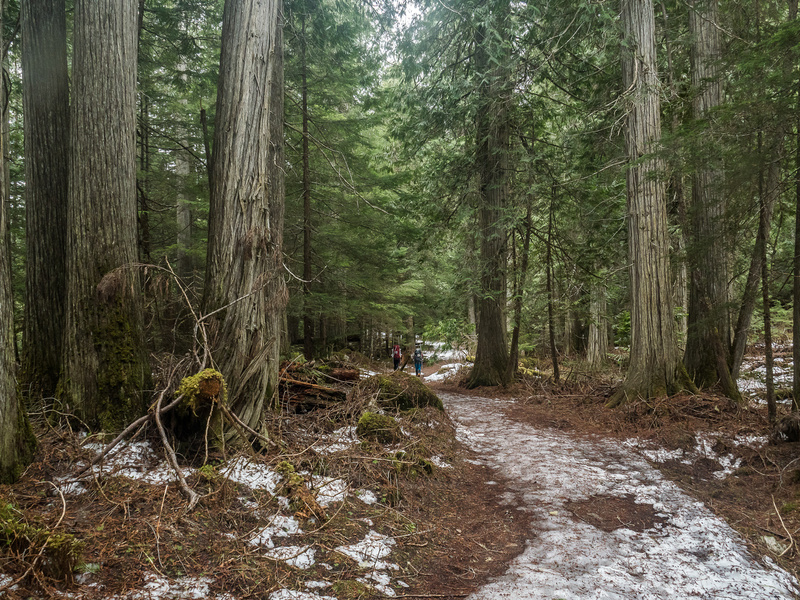 The exposure off this section can be interesting - especially on descent when the trail is really icy! Emperor Falls is not looking that impressive today. Note the hand rail at lower left? This section of trail was mighty interesting on descent. By "interesting", I mean "suicidal". 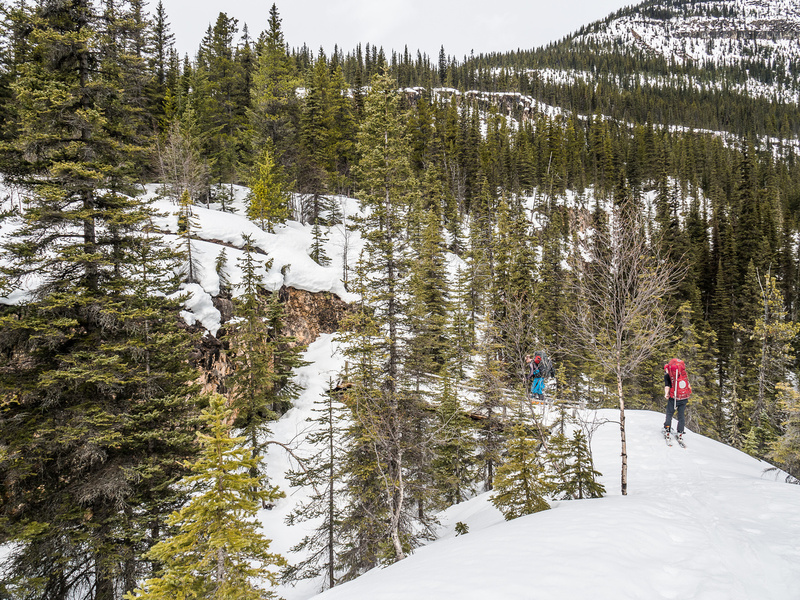 Just past the Emperor Falls campground, skiing along the Robson River flats before Berg Lake but done most of our elevation gains now. 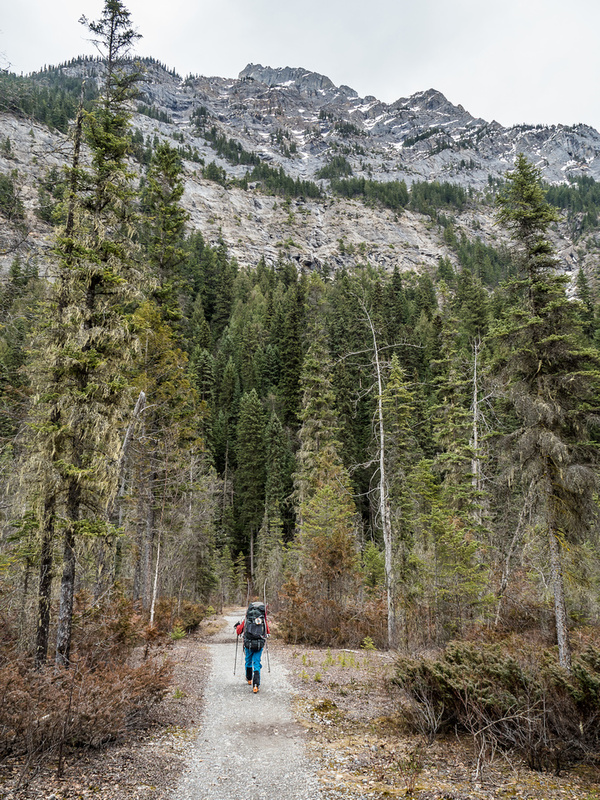 Robson's Emperor Ridge towers above us as we navigate the river flats before Berg Lake. 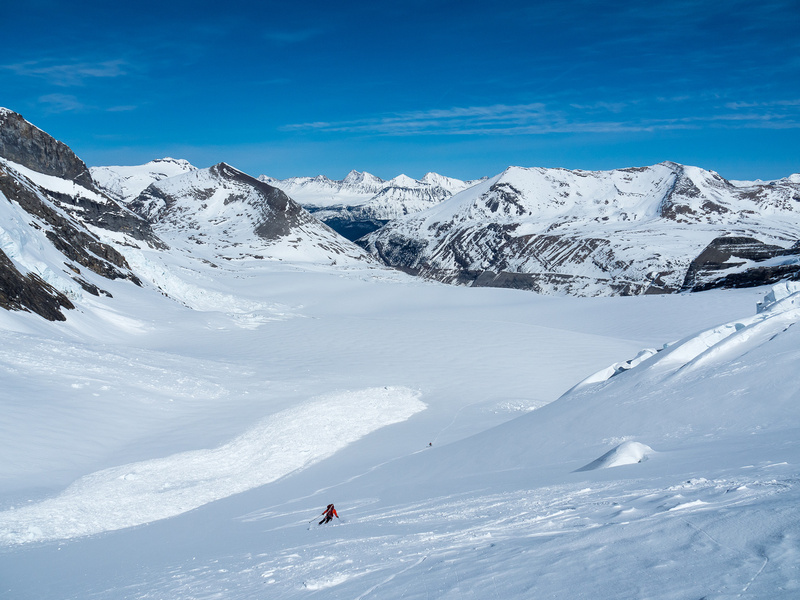 Skiing the flats before Berg Lake with the Berg Glacier on the right and Rearguard looming over it. Titkana Peak in the far distance at center. 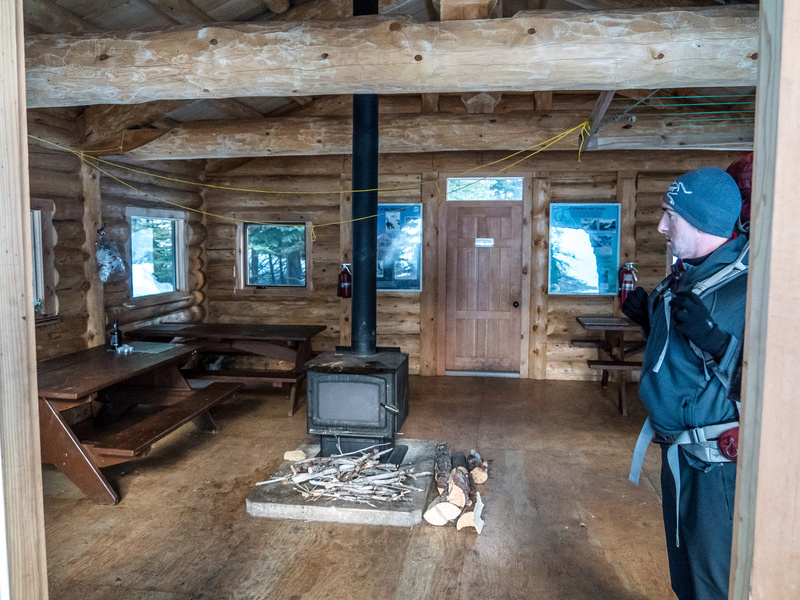 The rebuilt Hargreaves Shelter is a wonderful place to enjoy a warm fire - provided you do the work of scrounging for deadfall as there is no fire wood provided. 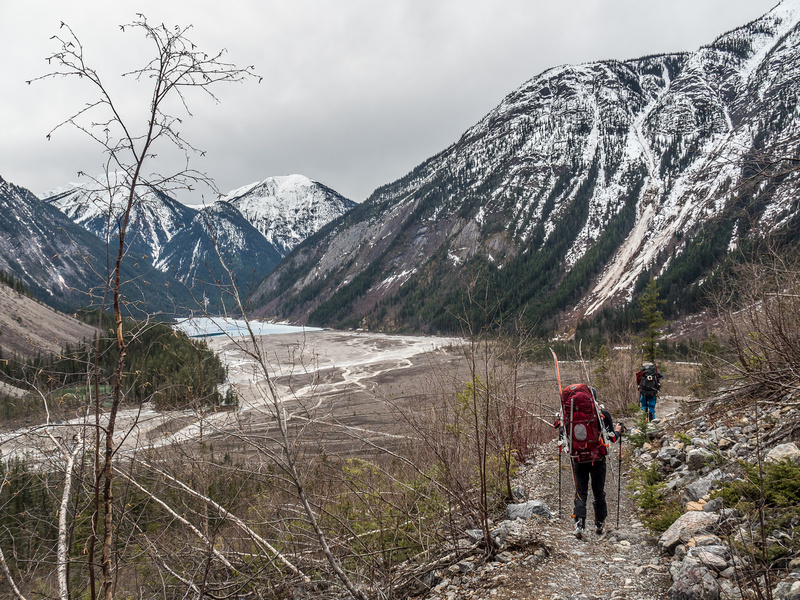 The rope is on as we head up the left side of the Robson Glacier. The Extinguisher Tower visible at right. 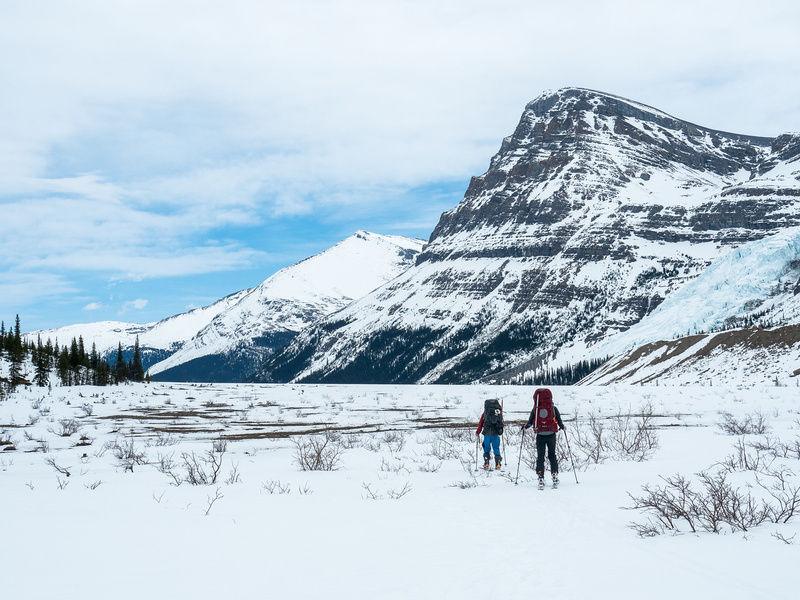 After approaching the Hargreaves Shelter at Berg Lake the day before via a long slog involving carrying our skis and skinning on mud, gravel and scree we were pretty bagged. After a party of 5 joined us in the shelter (quite late) we managed a few hours of restless sleep but way too soon Ben was waking us up. We got ready and headed into the dark night with millions of stars and light clouds above us. With no moon it was pretty black. 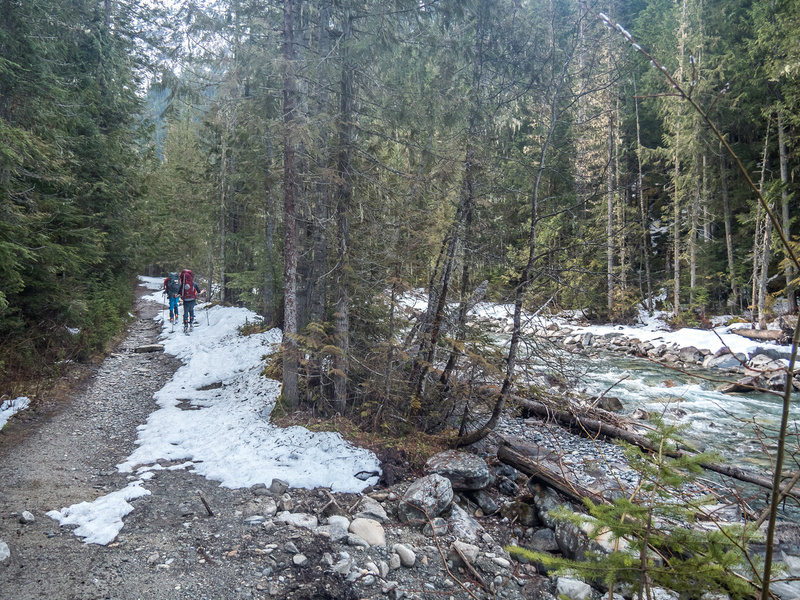 Ben led us up the creek bed towards the Robson Glacier next to the Snowbird Pass trail that I’d done in 2013. 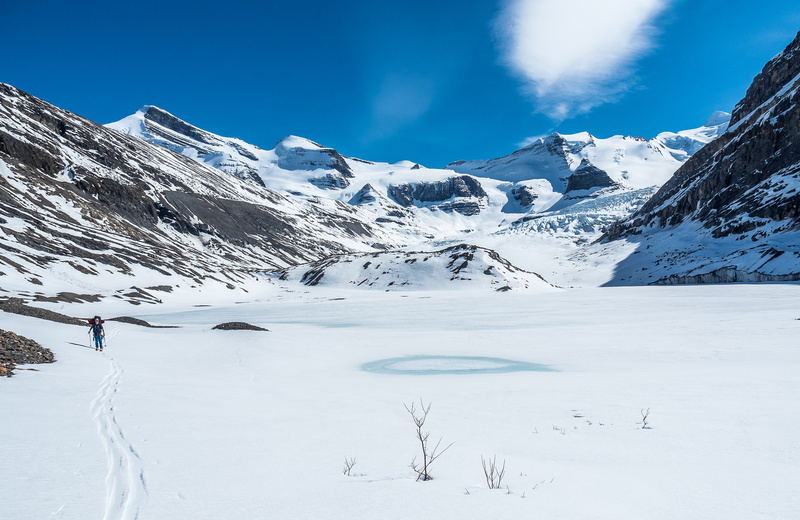 We crossed the lake at the toe of the glacier (without thinking about it too much – on the way back we avoided it as it looked a bit thin) and proceeded up on climbers left, following Ben’s group’s tracks from two weeks previous which were still visible. We stuck to the left hand side of the glacier to avoid the holes in the center. 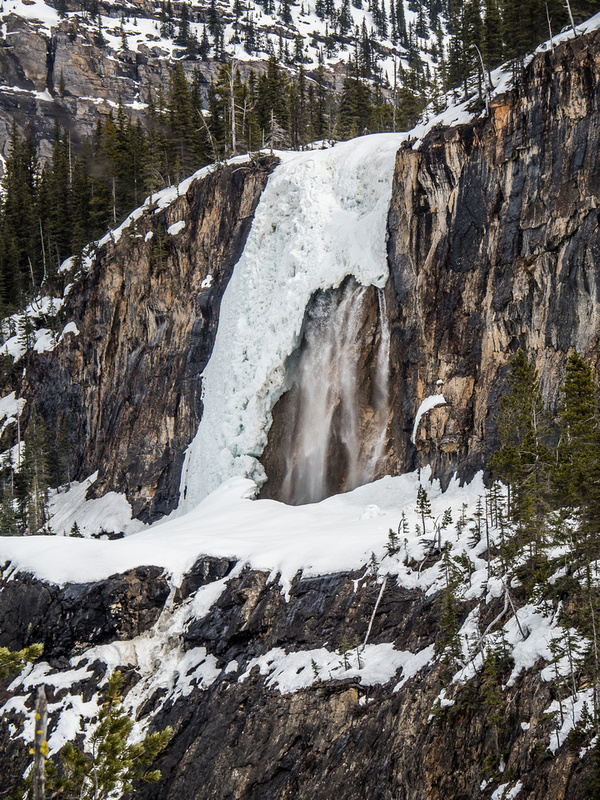 The right side was a major ice fall – no safe way through there. 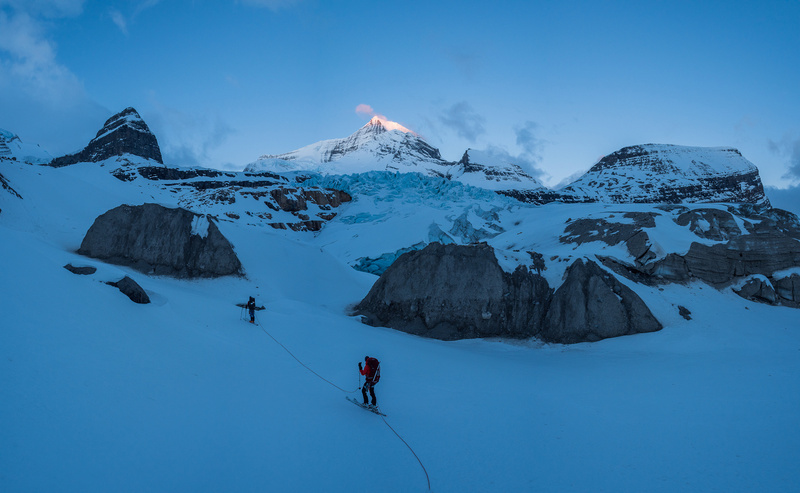 As we skinned past the ice caves Robson started catching alpine glow high above us. Extinguisher Tower at left, Robson at center and Rearguard at right. Good thing we had Ben’s GPS track from two weeks previous because even the left side of the glacier wasn’t totally straight forward. 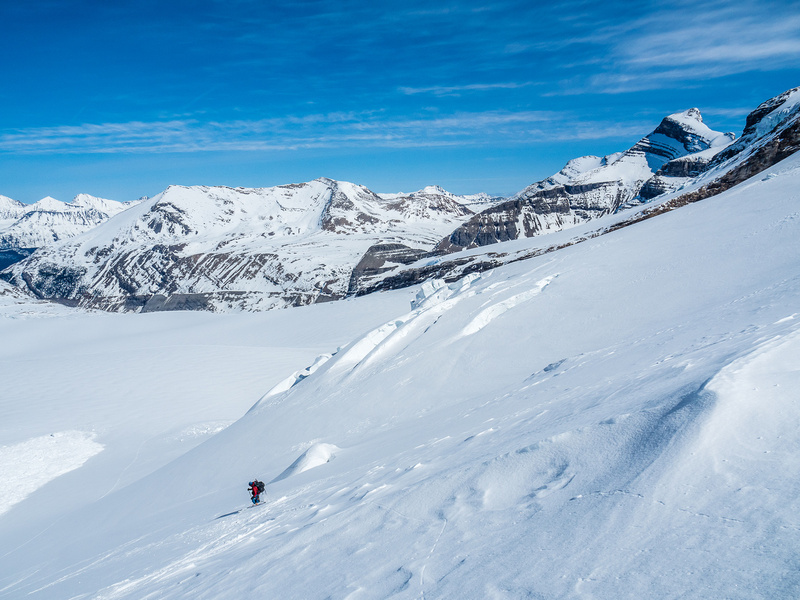 Especially of note were a few steep avy slopes we traversed while avoiding two large ice caves on the edge of the ice that would be very nasty surprises in a whiteout! 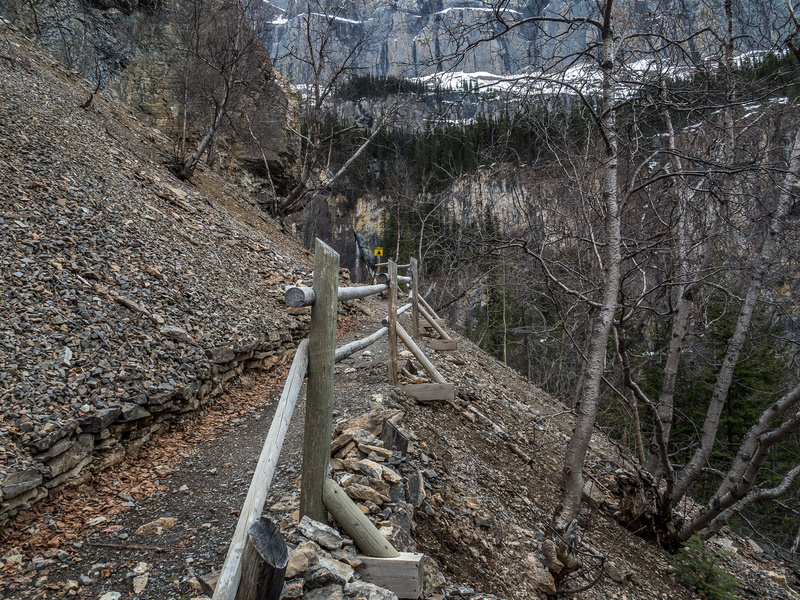 I can see why folks usually avoid the first part of the Robson Glacier by following the Snowbird Pass trail alongside it until cutting off to climbers right under the Extinguisher Tower. We continued to work our way up under Extinguisher Tower as daylight broke and we got some great shots of alpine glow on Robson. Right under the Tower we found an excellent camp site off the glacier but with enough snow to dig in a great little camp. After building our camp, it was obvious that Resplendent wasn’t a go for Saturday. Clouds were intermittently covering the upper slopes under the RR col.
One of the finest winter camps I’ve had the pleasure of staying in! Extinguisher Tower looms over us with Lynx at far left. We decided that with tons of time left we might as well work our way up Rearguard Mountain, so that’s exactly what we did! I have to say, Rearguard was more work than I thought it would be. 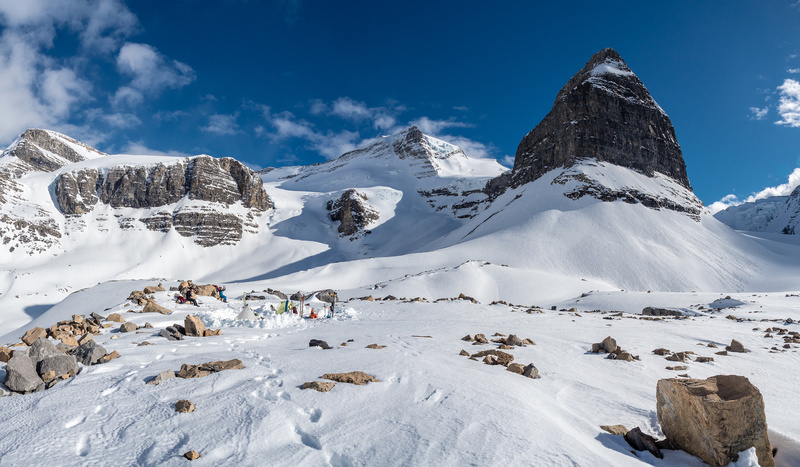 It was still 880m height gain from our camp which made the total height gain around 1400 meters from the Hargreaves Shelter – the same amount as Resplendent from our Extinguisher camp! 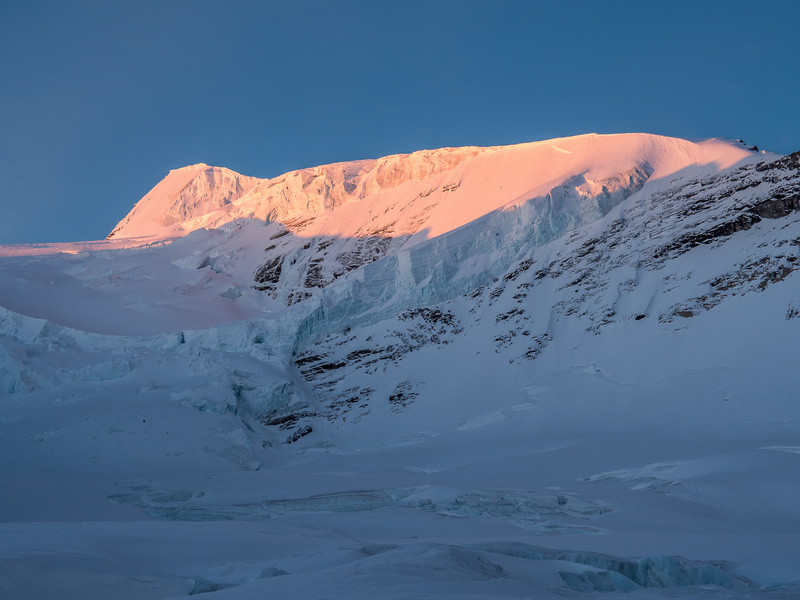 There are clouds over The Helmet (R) but Rearguard's summit is visible at left along with a couple thousand stars. 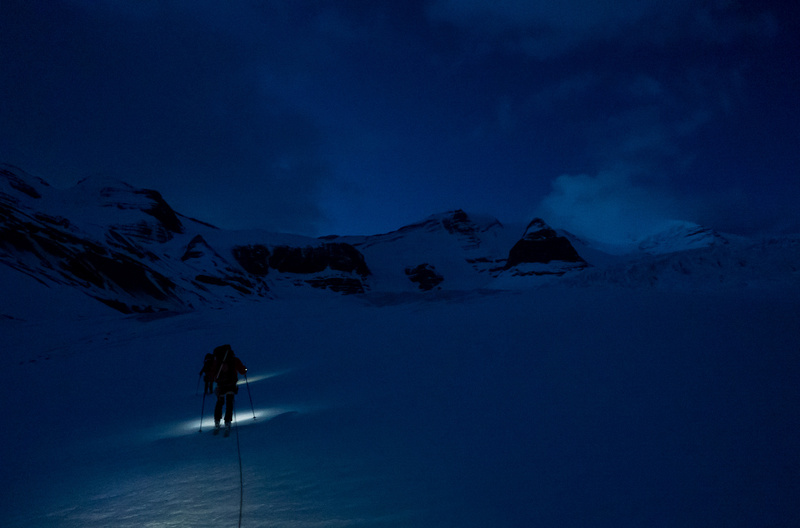 Pre-dawn light as we work our way alongside the glacier, avoiding holes and ice caves. The Extinguisher Tower at upper right. Steep skinning up moraines just off the glacier (climber's left) here. On the final ascent ramp under the Extinguisher Tower - our camping spot on the right, just above the rock cliffs. Skinning to our camping site with Rearguard stretching out in the background. Ben is cooking up something in our camp kitchen. 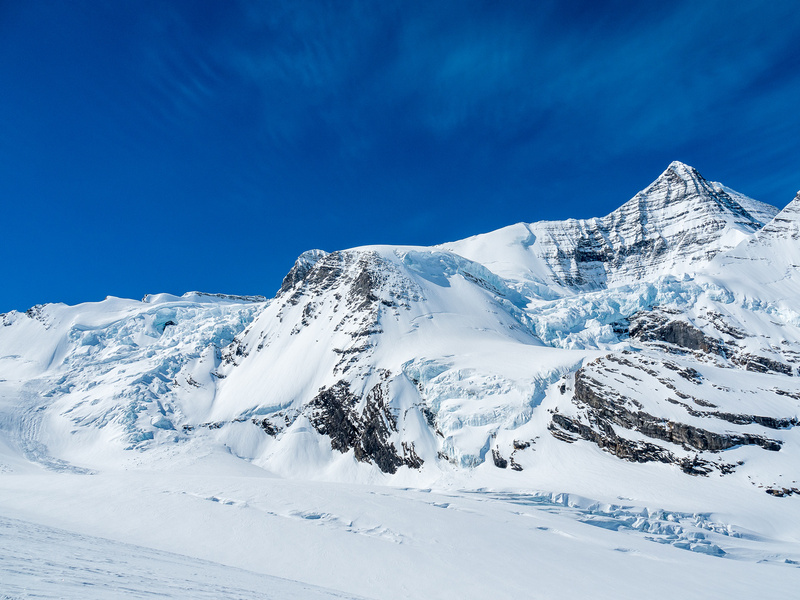 Rearguard at left, Mumm at center and Titkana / Tatei Ridge at right. Taking advantage of warm sunshine to dry gear. One of the finest winter camps I've had the pleasure of staying in! Extinguisher Tower looms over us with Lynx at far left. 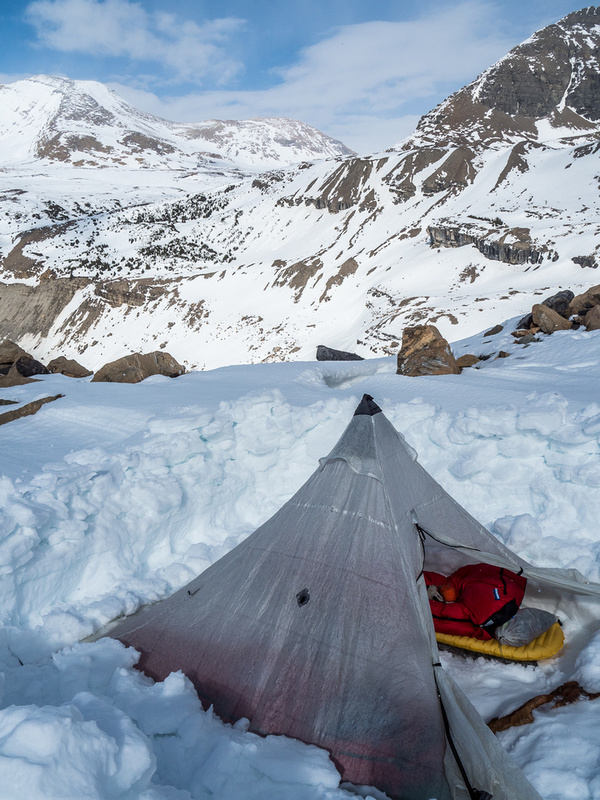 We awoke early on Sunday, April 20 2016 to a clear sky and millions of stars overhead in our winter camp beneath the Extinguisher Tower just off the Robson Glacier. 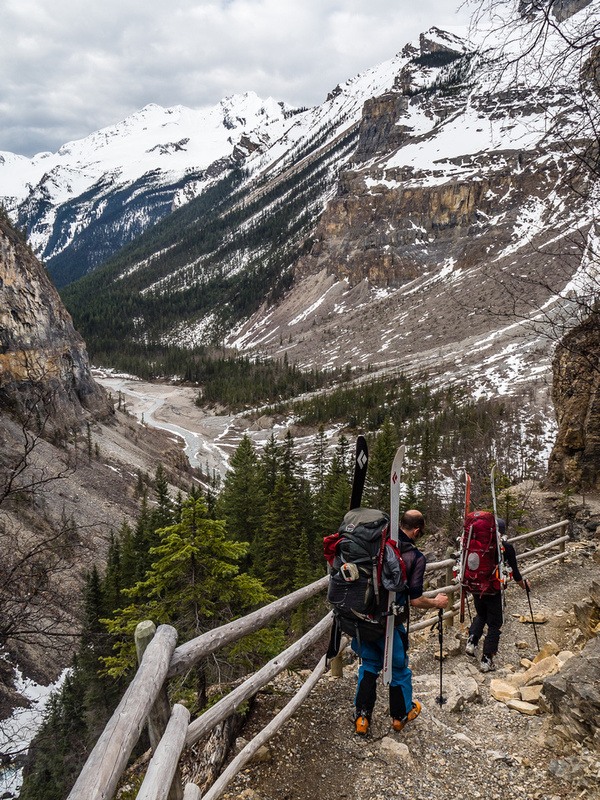 We were pumped to finally be ascending Resplendent on a perfect, clear spring day next to the mighty Mount Robson and the wild scenery all around us. 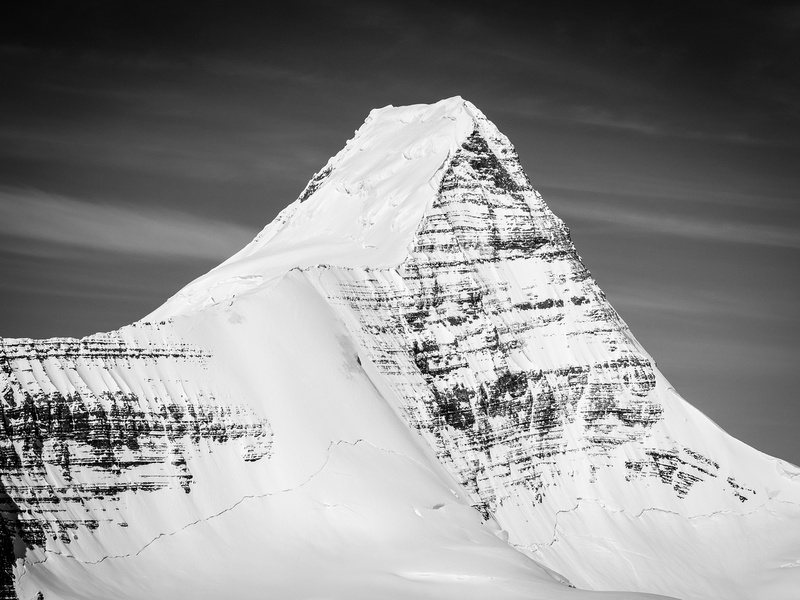 The day before, we’d skied and scrambled up Rearguard Mountain and got some sublime views of Resplendent, which only wet our appetites to stand on her summit. 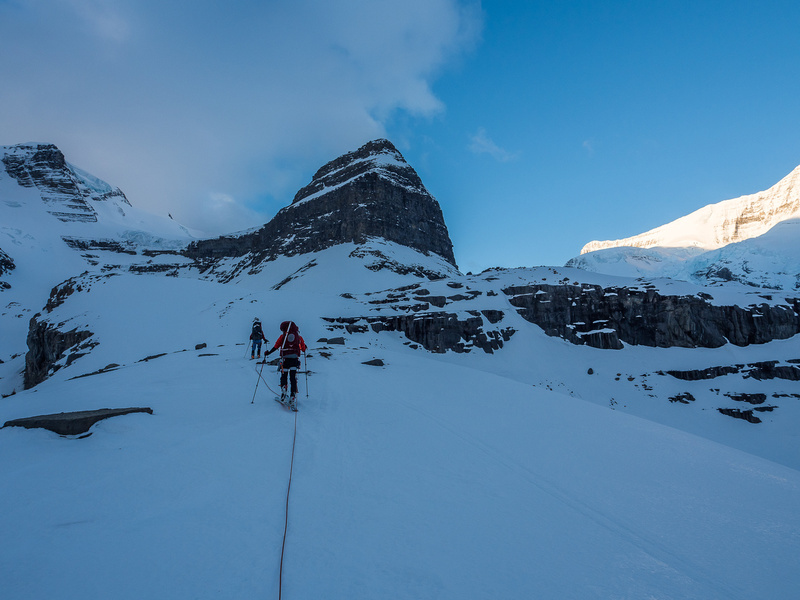 The temperature was fairly warm already early in the morning and slightly before sunrise we were skinning our up the Robson Glacier. 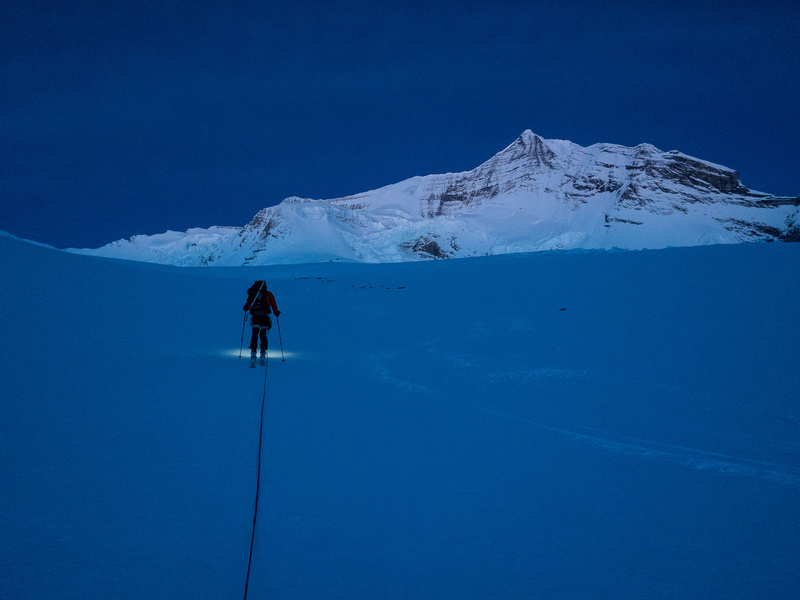 We could have started much earlier, of course, but considering the amount of crevasses and ice falls we had to negotiate around, over, under and beside, it didn’t seem very wise to head up the untracked glacier in the dark. 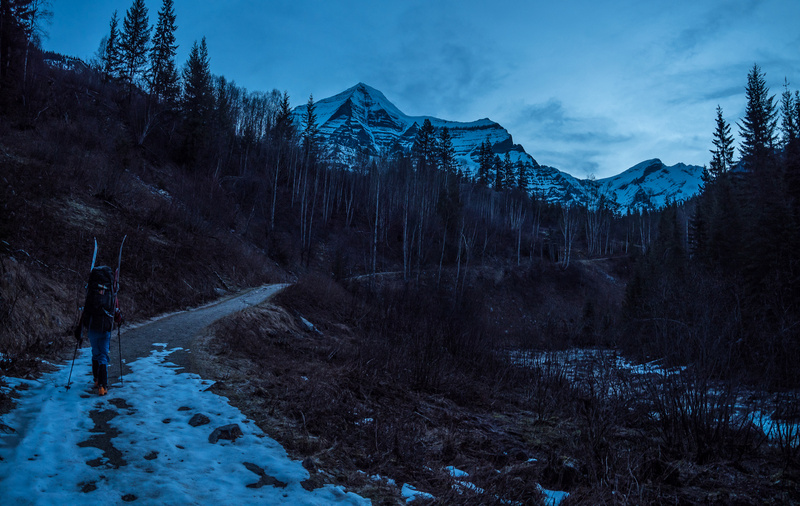 A clear sky over Mount Robson from camp. The glacier was frozen up hard and travel was quick and easy up to the steep ramp that Ben had scouted two weeks previous, heading up through crevassed avalanche terrain opposite the infamous “Mousetrap” – a steep section of the Robson Glacier under The Dome which avalanches ice and snow on a very regular basis and contains many crevasses large enough to swallow several city transit buses and the occasional small house! 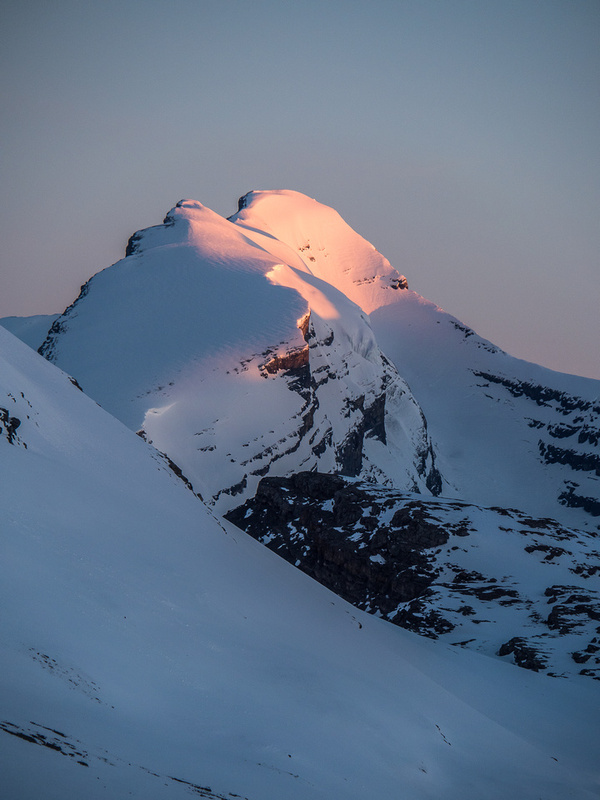 Speaking of ice avalanches, we witnessed a large serac collapse in the Robson Cirque beneath The Dome and The Helmet just as Mount Robson caught alpine glow high above all the action. 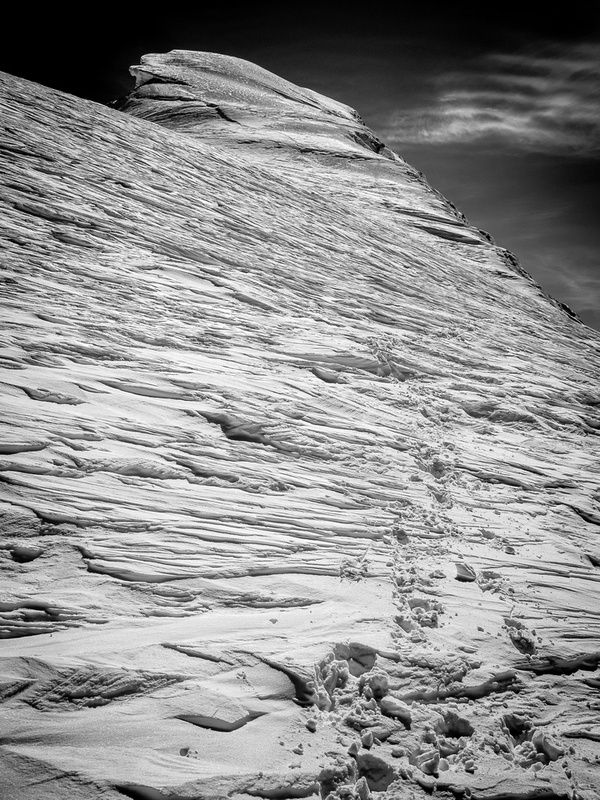 Coverage on the glacier was great, and we only crossed one obvious snow bridge before turning climber’s left under the RR col to ascend Resplendent. 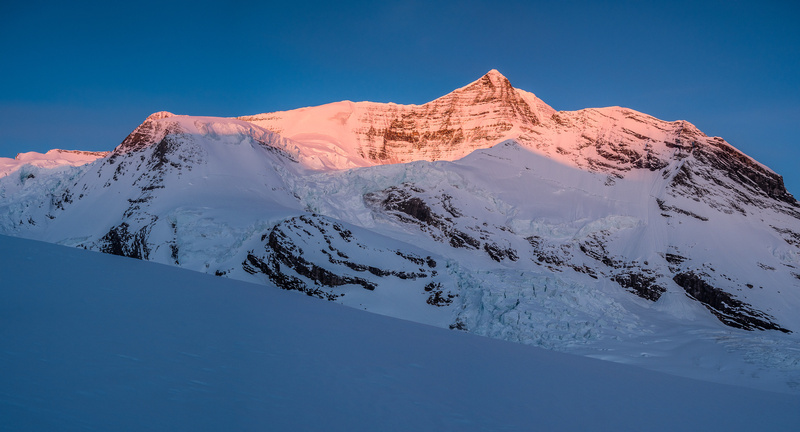 The top of Mount Robson is now bathed in soft morning light. 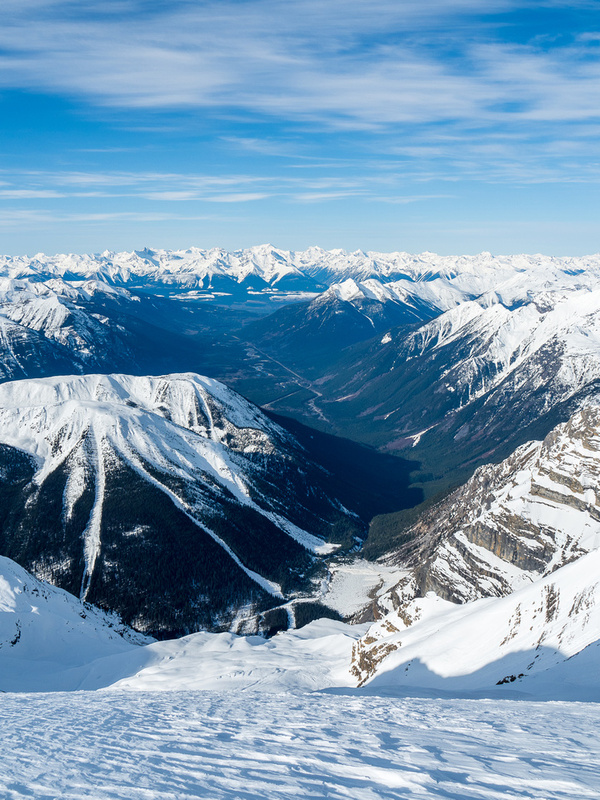 The steep grunt up to the base of the summit ridge was slow but steady and soon we were at the point where the views were becoming quite brilliant in every direction – especially towards Robson and west towards the Columbia Mountains in British Columbia (i.e. 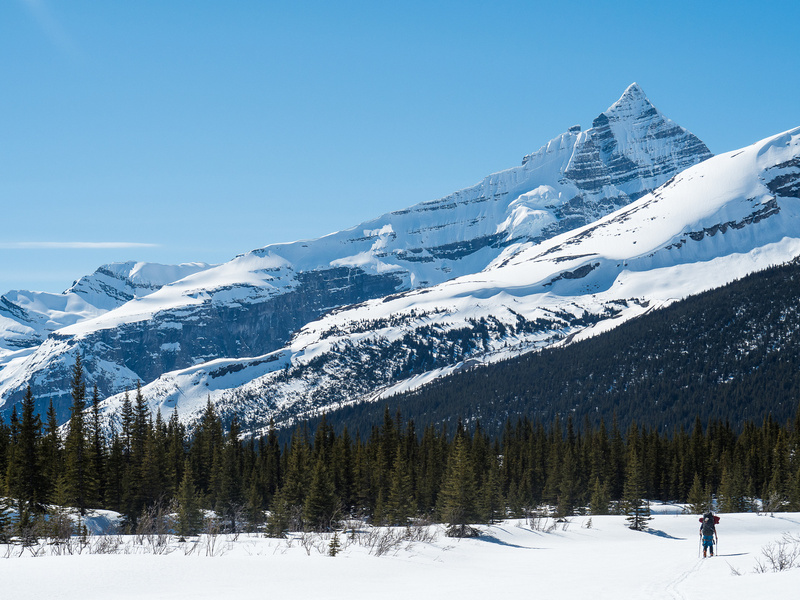 not the Rockies), including the only two 11000ers in the Cariboo Range, Sir Wilfred Laurier at 11,535′ and Sir John Abbott at 11,148′ high. We could also clearly see the entire Mousetrap, the RR col, Kain Face, upper route on Robson, The Roof, The Dome, The Helmet and many other familiar landscapes. One annoyance was peaks like Mumm and even The Dome which never seemed to get smaller, even though we knew we had to climb higher than them eventually. Very nice to have good visibility here! Ben leads up the ramp through the crevasses and seracs opposite the Mousetrap which is clearly visible at right. 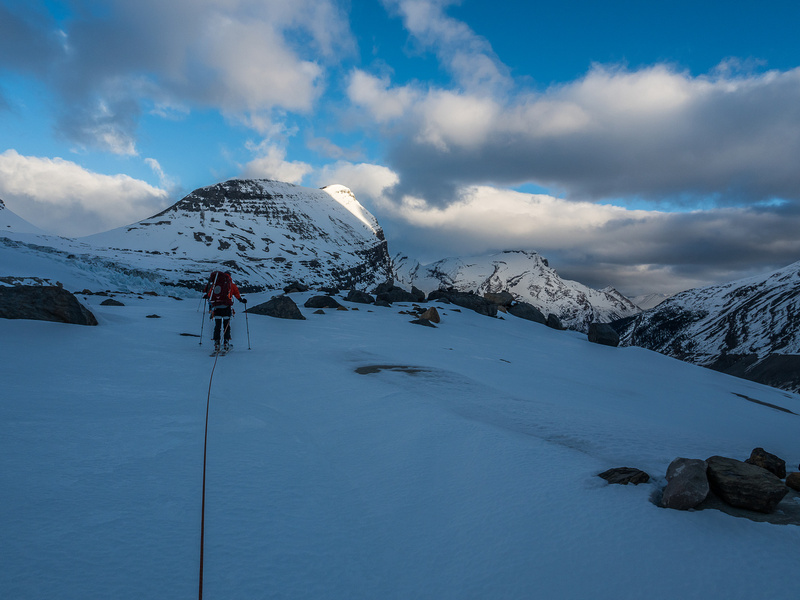 We skied a short way up the west side of the north ridge before deciding that the slope was too icy and steep to ski safely or enjoyably and switched to axes and crampons for the remainder of the ascent to the summit. Resplendent it technically very easy – especially in the conditions we had with good coverage and just soft enough snow to kick steps where needed. That being said, I would still caution that the exposure down the west face is staggering in some spots. Ben was worried about getting off the summit slopes as soon as possible and I didn’t notice the exposure until descent when it stares you in the face. 🙂 You must have very solid avalanche conditions to ascend this peak in winter conditions! 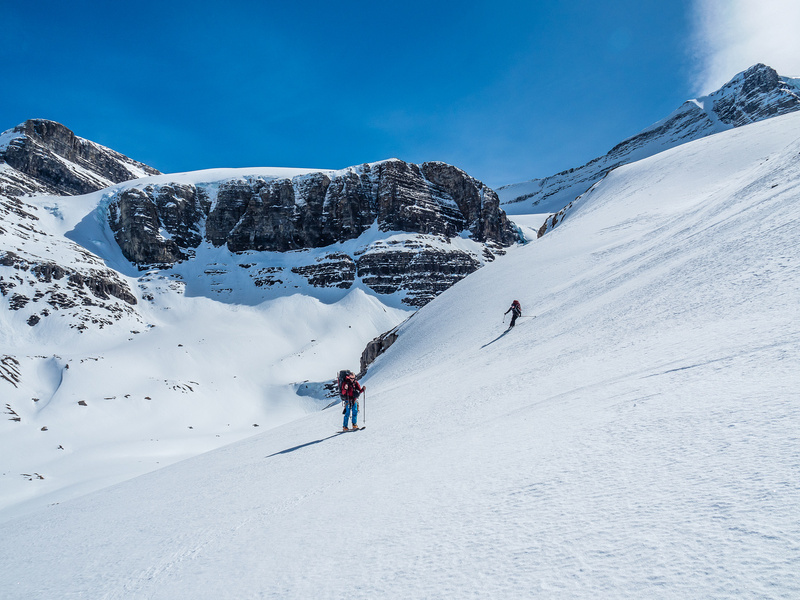 The upper slopes of Resplendent reminded me a lot of another ‘easy’ winter mountaineering objective that has some incredible westerly exposure on the summit ridge, namely Mount Wilson in Banff National Park. Yet another steep roll. 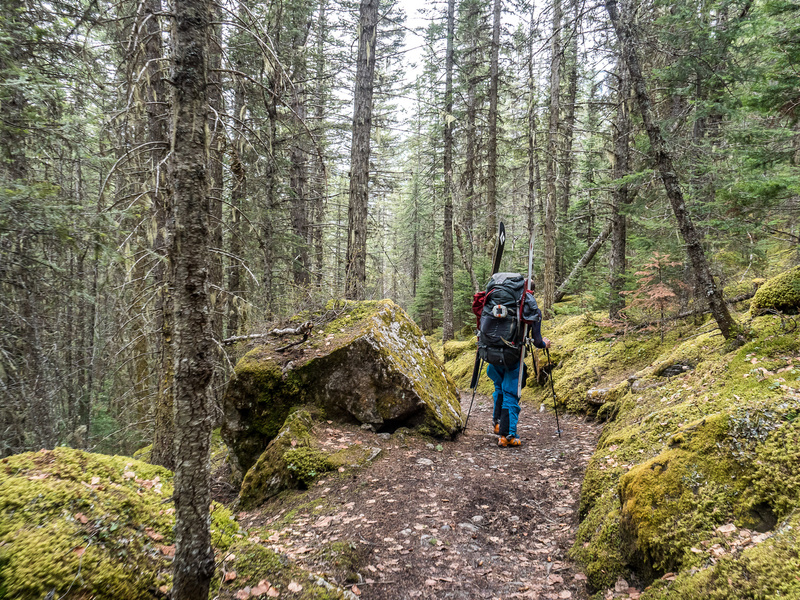 There are about 4 or 5 places where you might think you’re topping out only to be disappointed when you crest a steep roll and see more climbing ahead. Another interesting twist on Resplendent is that it’s further and higher than you expect from the RR col area to reach the summit. Every time we crested a bump we thought we must be “close” – but the first 4 times we weren’t. 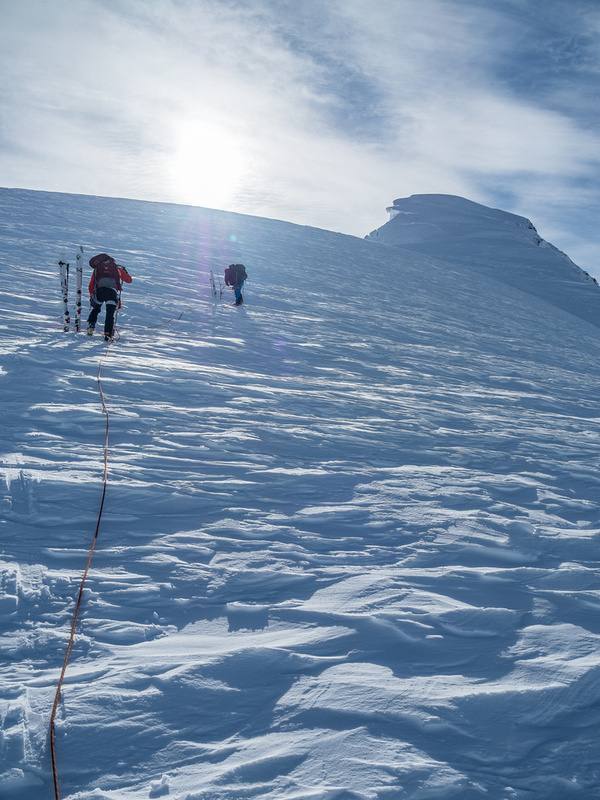 🙂 When we finally did approach the true summit we had to give the huge winter cornice a very healthy respect at the risk of triggering a cornice collapse – something that does happen fairly often on this peak. 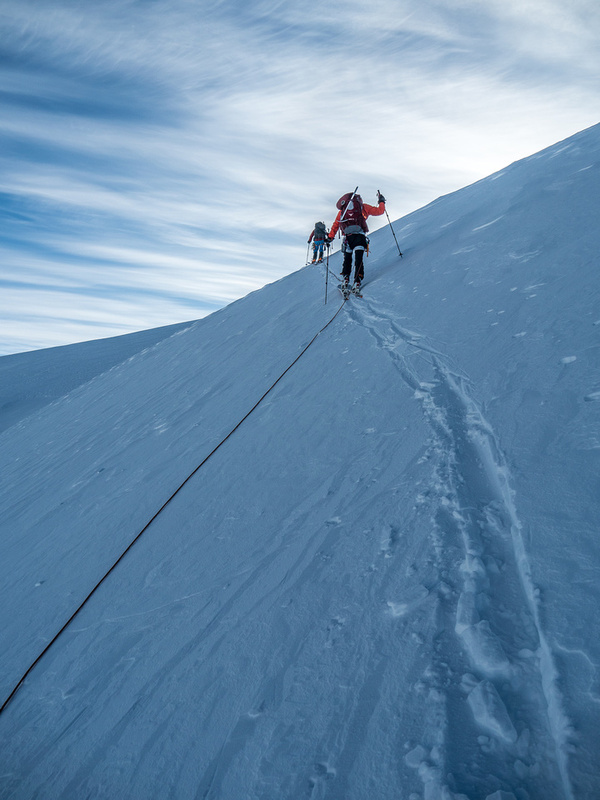 I suspect we were still on the summit cornice, even with being cautious. 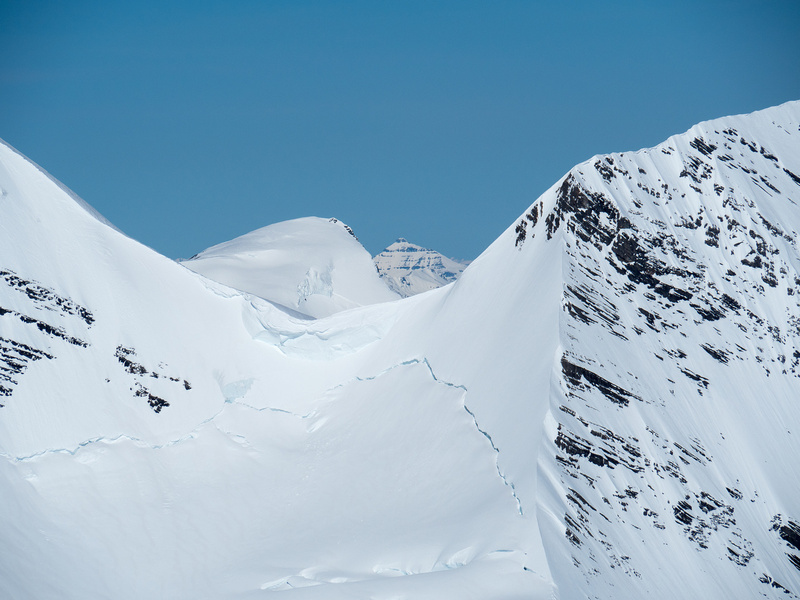 As a consequence of the massive cornice we couldn’t see east, which was a tiny bummer. BUT the views in every other direction more than made up for the lack of views east. 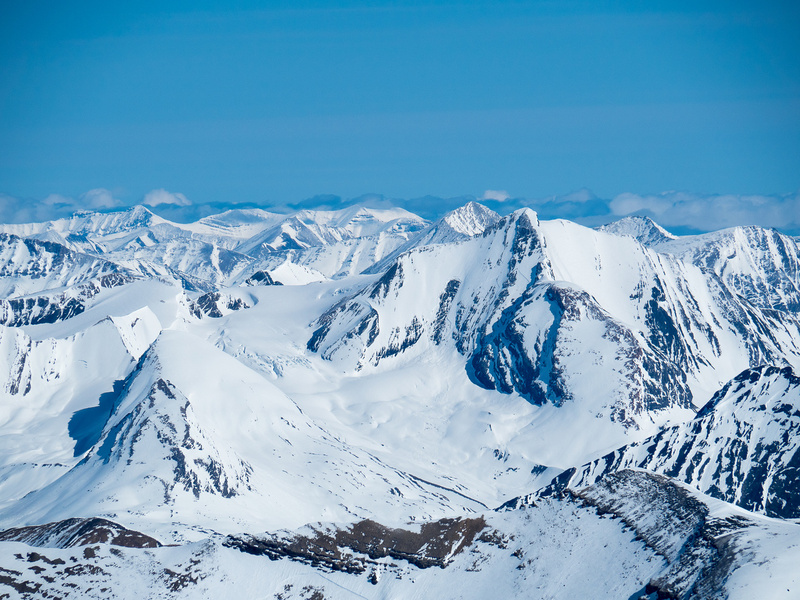 As I sat there on top of yet another Rockies 11000er, I was struck by how lucky we were to be up there with million dollar views, not a breath of wind and clear skies for many kilometers in all directions. After taking a zillion photos we reluctantly started our descent before the steep summit slopes could soften on us. 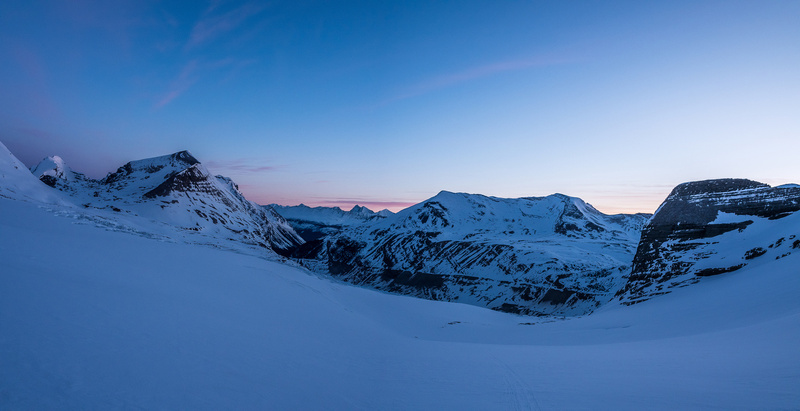 A labelled panorama of the Premier Range in the Caribou Mountains. 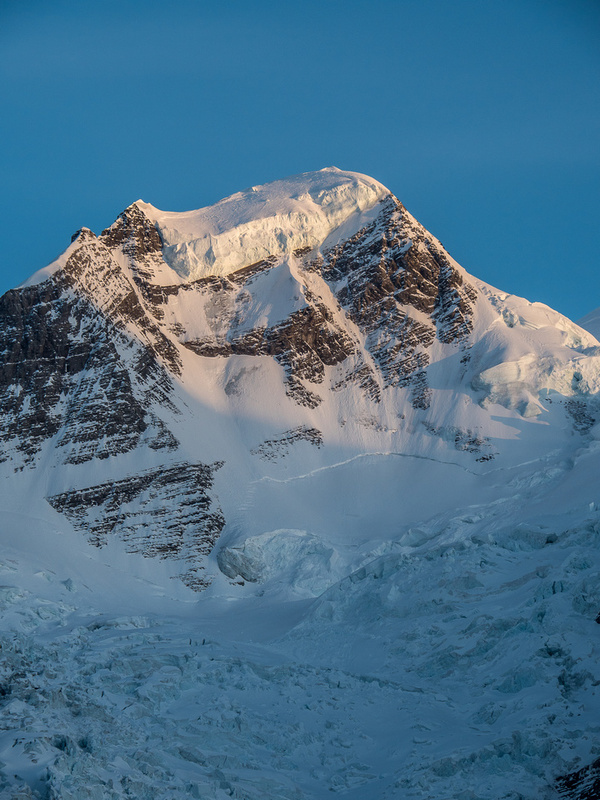 From L to R the common areas of the massif include The RR col at lower center, the Kain Face rising above The Dome to the right of center with the Mousetrap in the foreground coming off The Dome. 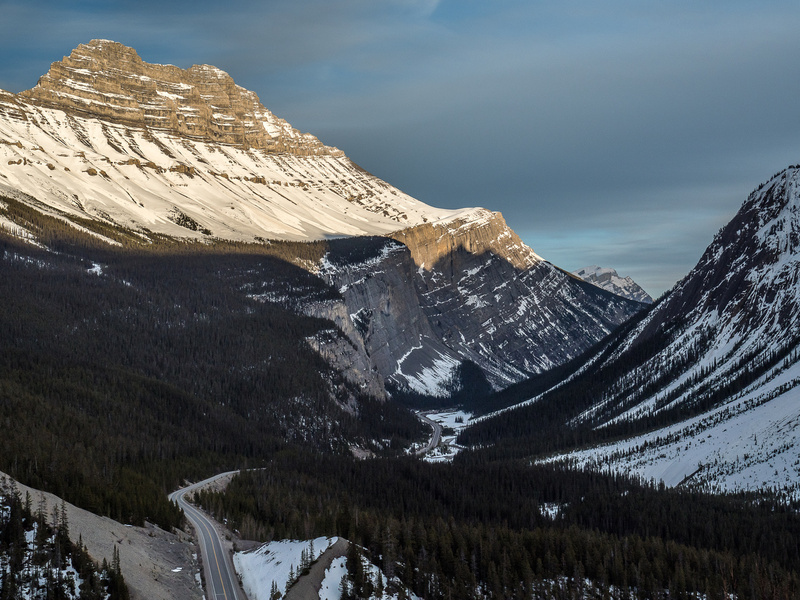 An incredible panorama looking north (L) to west (R) includes Anne-Alice, Gendarme, Chown, Wolverine, Palu, Mumm, Calumet Ridge, Swoda, Calumet Peak, Moose Pass, Chetang Ridge, Tatei Ridge (Titkana) and of course many others. The Kain Face was tempting Ben and I all day… Already some ice patches too. To be honest, I thought the upper section around The Roof looked spicier than the Kain Face but maybe that’s just the angles playing with my eyes. Descending Resplendent with million dollar views – exactly what you want for this particular 11,000er! There’s really no reason to climb Resplendent unless you’re going to see this IMHO. The descent really threw the exposure down the west face at us. 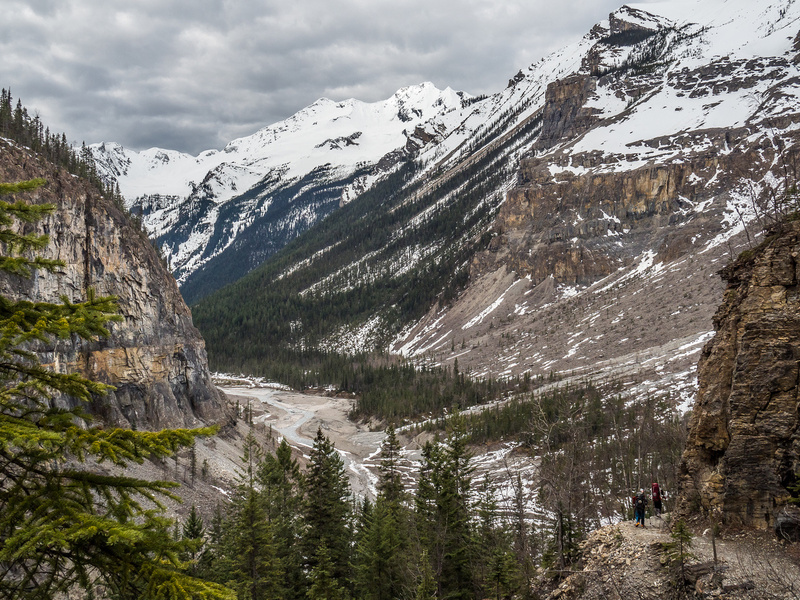 It was both interesting and depressing to look down roughly 2.5 vertical kilometers to the Kinney Lake approach trail and realize how far we’d come and how far we had to go back! Soon we were back at the skis and it was time to cash in the turns that we’d definitely earned on this trip! A tiny bit of dust-on-crust made for a very quick and efficient ski all the way back to our camp. 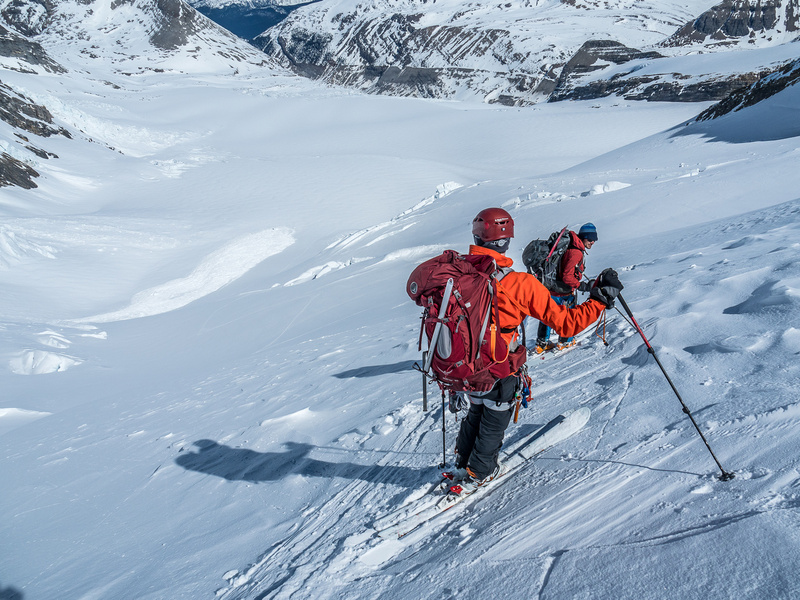 We were very careful to follow our up-track and skied down unroped – but this was a very personal decision that was agreed to by every member of the team (assuming that conditions were safe) before even starting the trip. And another shot to convince you that Resplendent is also well-named. She’s a beautiful summit! 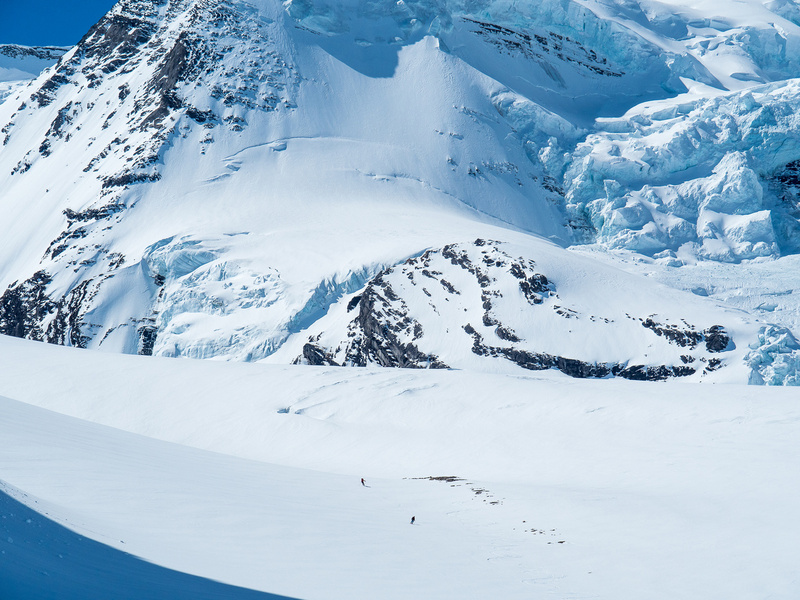 For scale, find Ben and Mike in this shot – they’re just ready to start their ski descent. Mike cruises down the Robson Glacier. It felt very good to finally stand on top of Resplendent Mountain with incredible views of Robson and other peaks in the area including The Helmet. We basked in summit afterglow and extremely warm spring sunshine back at our camp for an hour, before slowly packing our gear. The ski down to the Hargreaves Shelter got hotter and hotter the lower we went until we were literally sweating just by standing still and breathing. At the shelter we had a lazy late afternoon / early evening before sleeping our last night at Berg Lake. 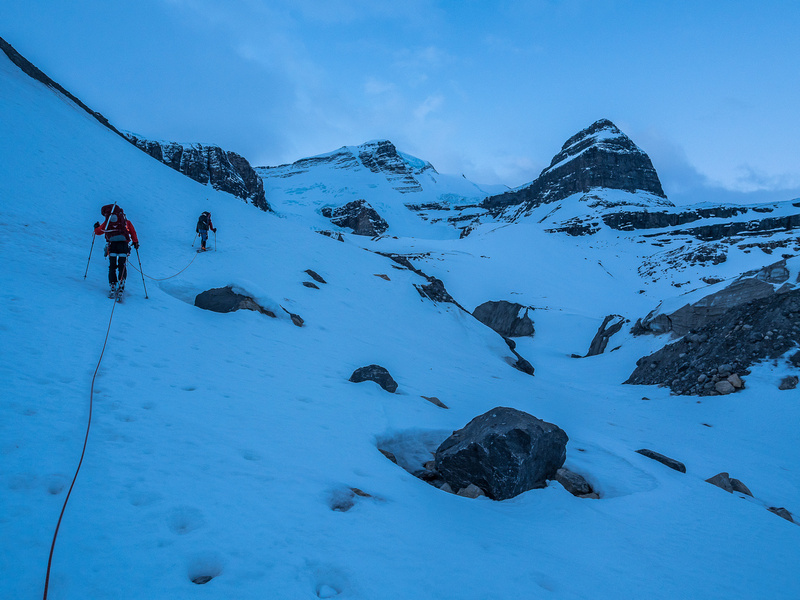 Heading up the Robson Glacier at first light. The Dome is directly above us here. 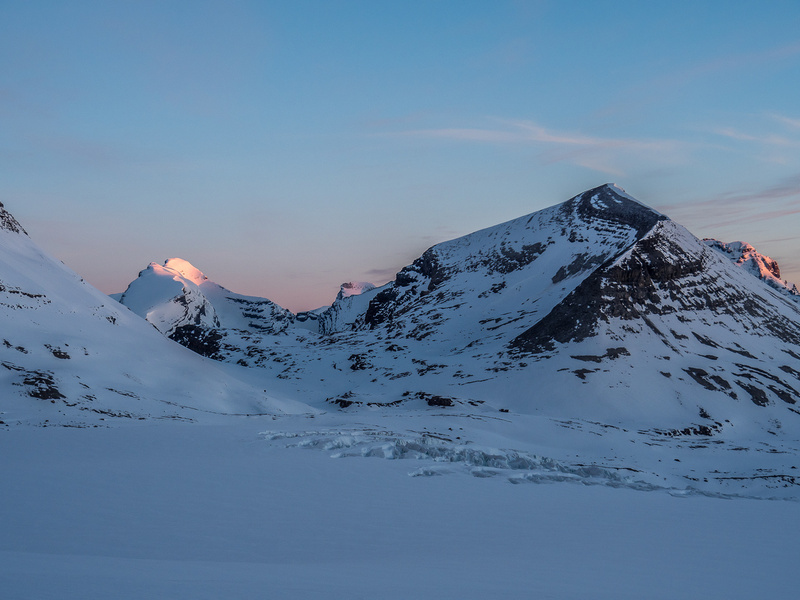 Looking back from the glacier with Anne-Alice, Rearguard, Tatei Ridge and Extinguisher Tower from L to R.
Mount Robson catches alpine glow as an ice avalanche thunders down the Robson Cirque in the foreground! The whole top of Robson is now bathed in soft morning lighting. Remembering the grind up Rearguard the day before. Anne-Alice at left. Resplendent living up to her name! 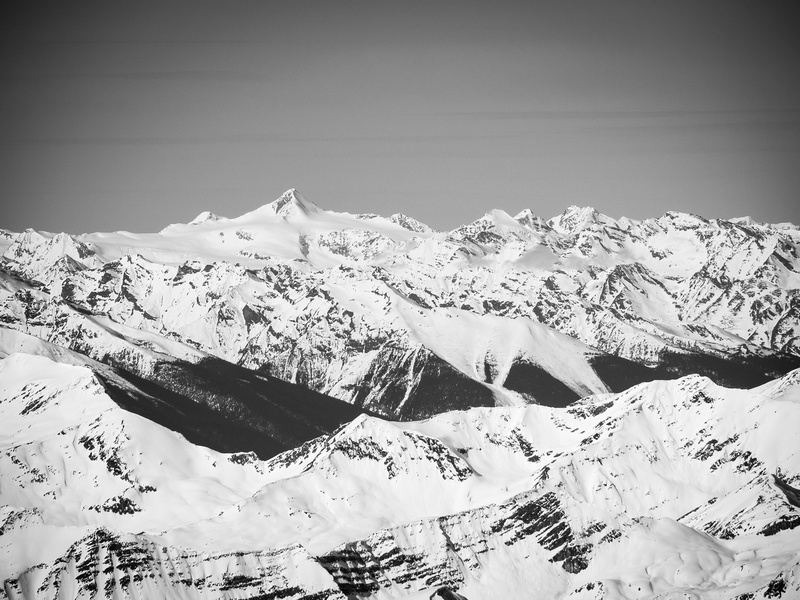 Anne-Alice is high on my list for a winter ski ascent now. The entire upper Robson / Resplendent massif now catching the morning sun as we approach the base of the Mousetrap (just to our right up ahead). Skiing below the Mousetrap. We'll go left here to work our way through crevasses and seracs visible at upper left. 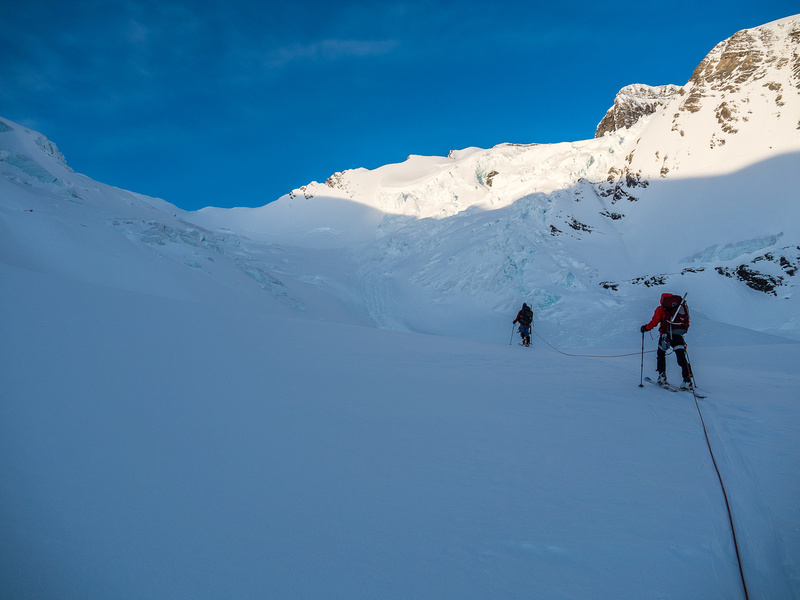 Ben leads up the ramp through the crevasses and seracs opposite the Mousetrap which is clearly visible at right. As you can see, there is objective hazard from seracs and avalanches here. Not to mention, it's bloody steep! Gorgeous views back down the Robson Glacier and our approach. Great views of the Mousetrap at left leading up to The Dome. The Roof at upper left and Robson towering above everything else. 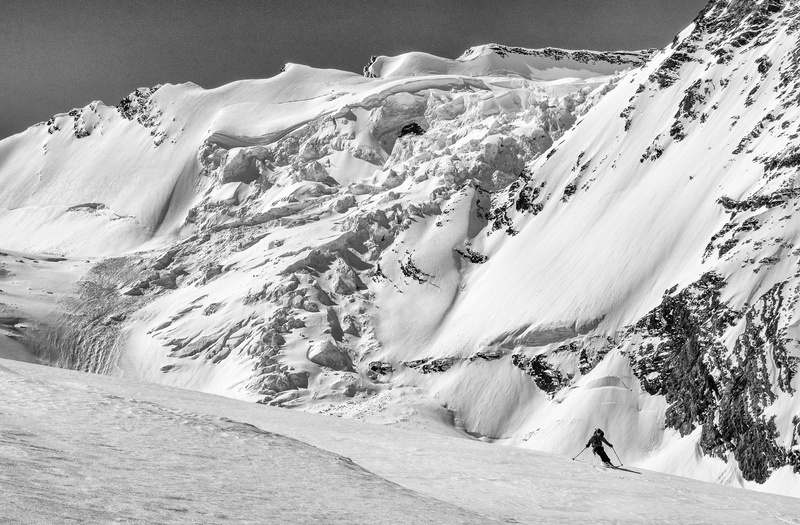 The slope steepened near the "ramp" which led over a slightly open crevasse to the upper bowl just under the RR col. Stunning views to the west from near the RR col. The slope steepened and hardened to the point that skiing anymore was useless and possibly dangerous for our abilities. 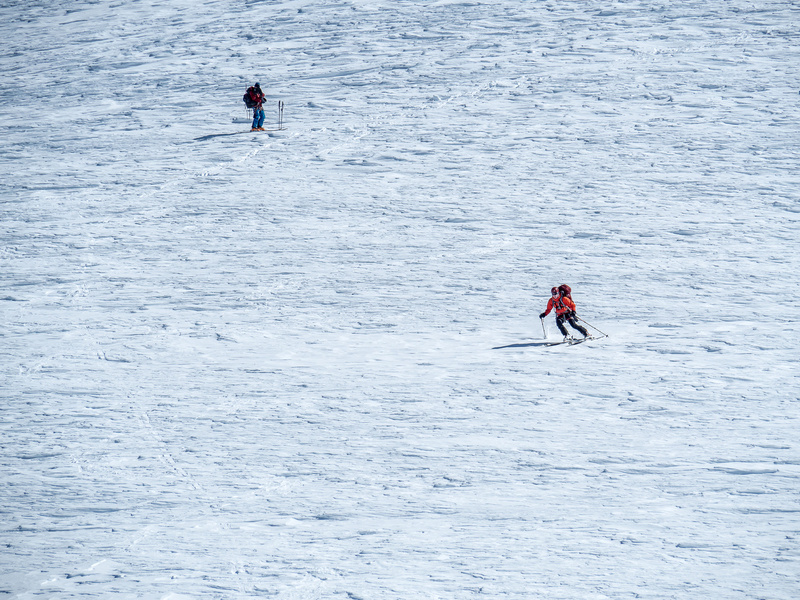 Don't underestimate the final slopes of Resplendent. It's still around 400 meters elevation gain from the col and it's steep and exposed in places. 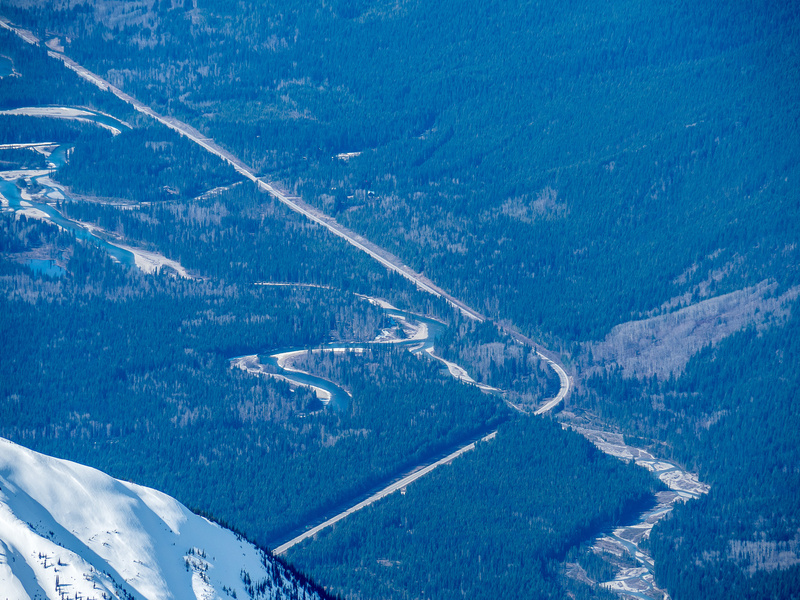 Looking way down to the Robson River valley and our approach. The Patterson Spur at right and Campion Mountain at lower left. 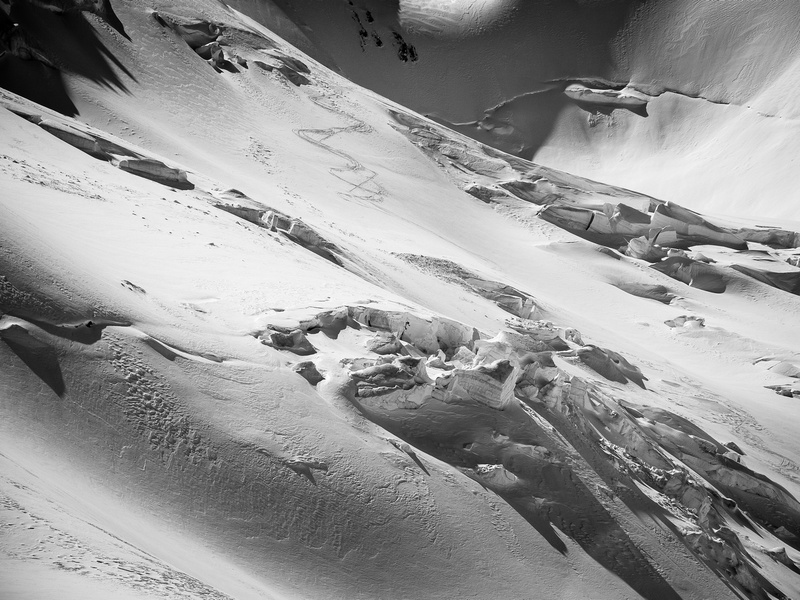 This is what you see when you look down the ascent route - over 2,000 meters straight down the west face! 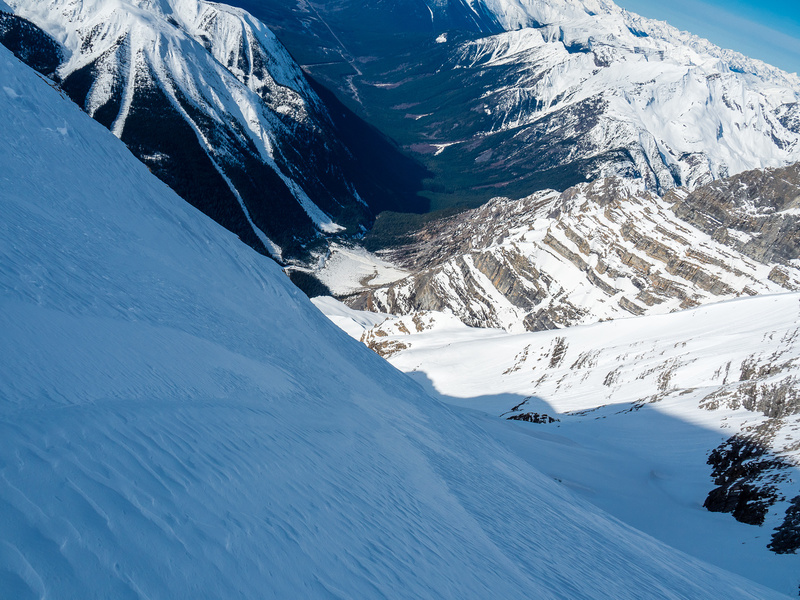 Mount Robson and the Kain Face as we ascend Resplendent. The Helmet to it's right doesn't look like much in comparison but it's also an 11,000er. 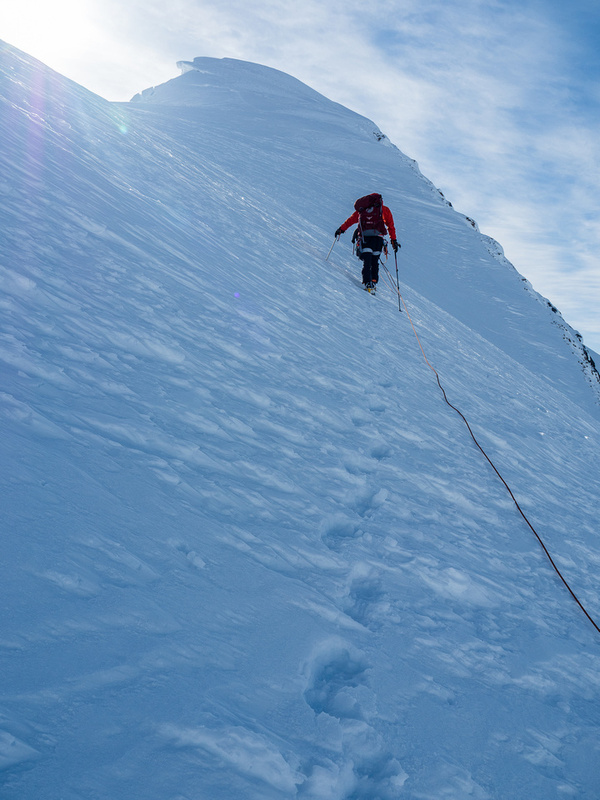 There are some surprisingly steep rolls on the summit ridge of Resplendent. 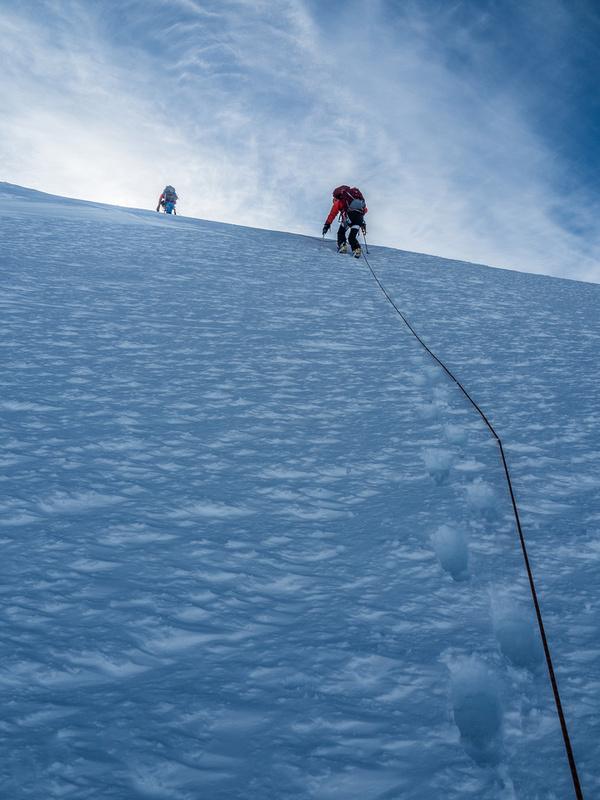 There are about 4 or 5 places where you might think you're topping out only to be disappointed when you crest a steep roll and see more climbing ahead. Summit view to the south towards Clemenceau. Mount Quanstrom is the highest peak in the Wells Gray Group. 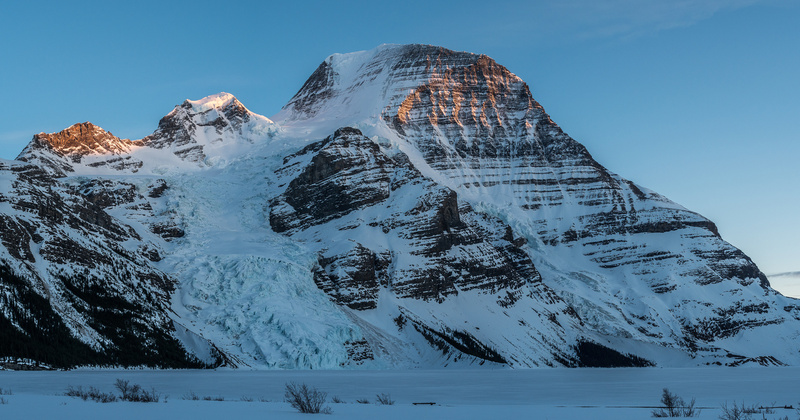 Mount Robson in all its glory! Mount Phillips (named after "Donald 'Curly' Phillips") shows up through the Robson / Helmet col. 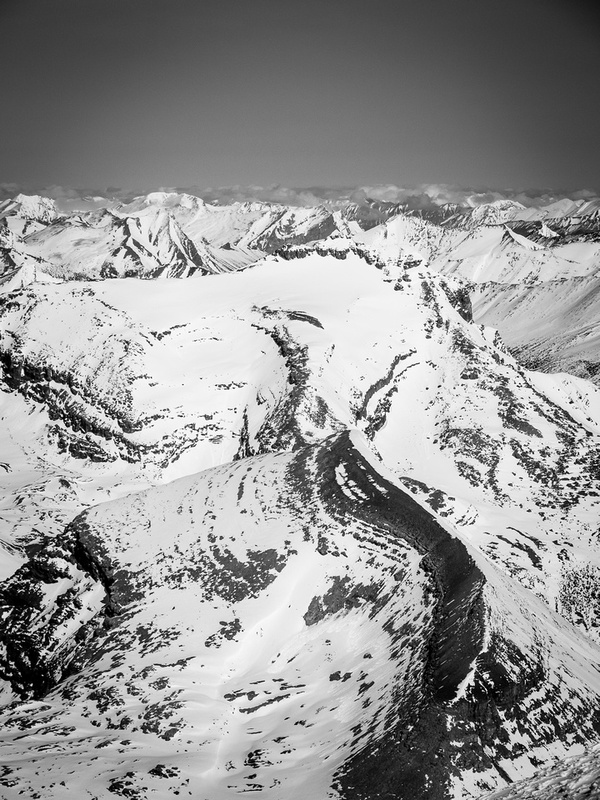 Looking north over Anne-Alice, the Mural Glacier and Gendarme Mountain towards the obvious bulk of Mount Chown. The Kain Face was tempting Ben and I all day... Already some ice patches too. Rearguard doesn't look large now does it?! It's the 'tiny' hill in the foreground with Mumm not looking much larger just above it at center. 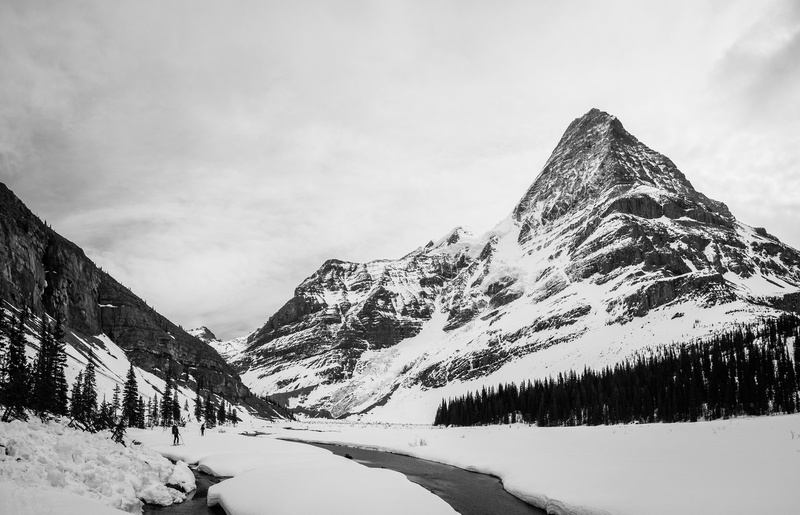 Calumet Peak soars over Moose Pass - part of the Moose River Route that I would like to hike some day. 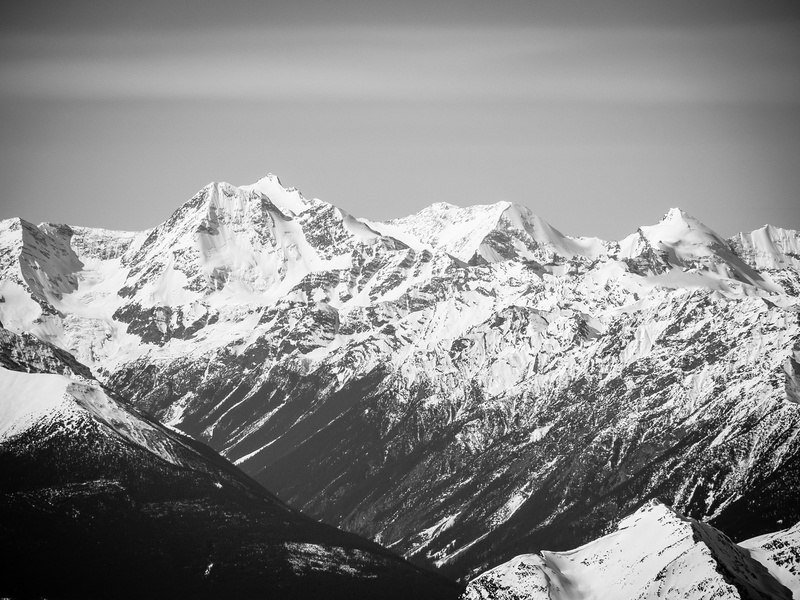 The second highest peak in the Cariboo's and only other 11000er, Mount Sir John Abbott rises at left with John Oliver to the right. Descending Resplendent with million dollar views - exactly what you want for this particular 11,000er! Can't get enough of this view! Don't underestimate this 11,000er. It's still a large mountain even though Robson makes it seem 'small' in comparison. She's a beautiful summit! For scale, find Ben and Mike in this shot - they're just ready to start their ski descent. 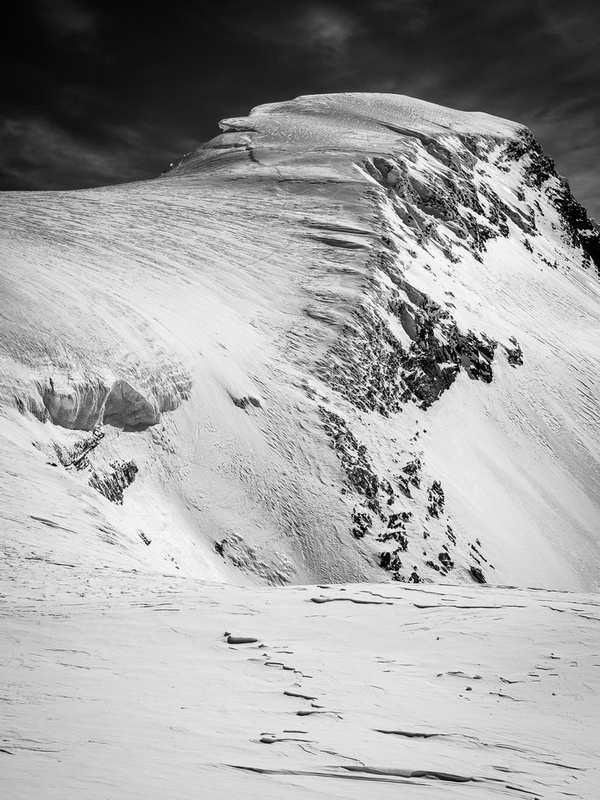 Another shot from near the RR col showing the upper ascent slopes of Resplendent with our tracks visible. Mike starts the ski down Resplendent! 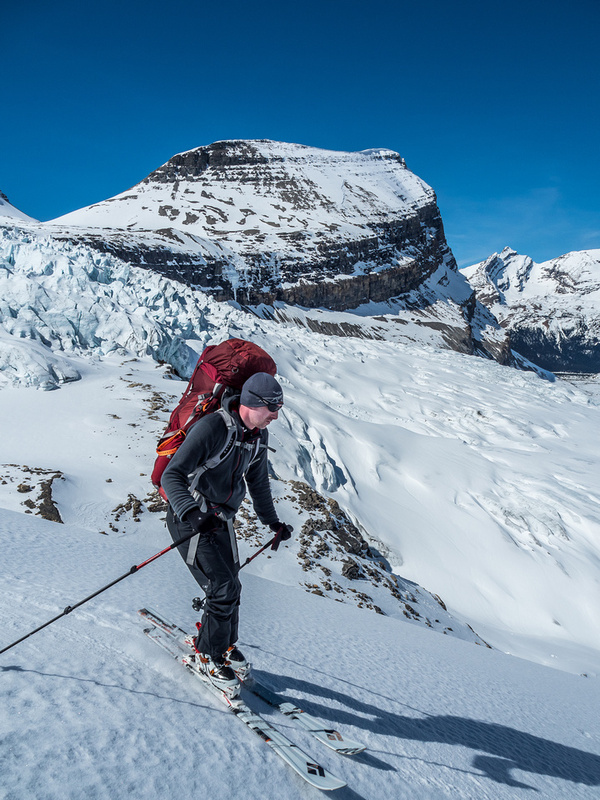 Mike skis down under the Mousetrap and Mount Robson. 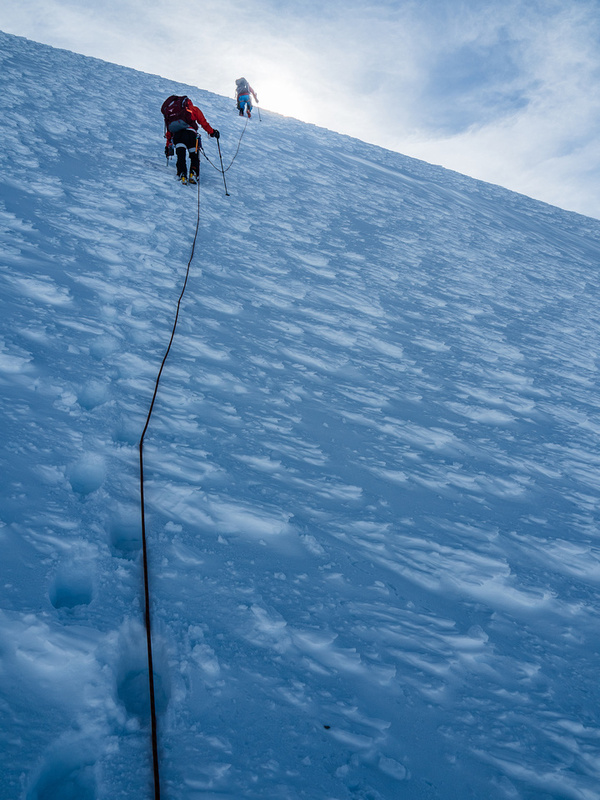 Scoping our line down the steepest and most exposed (to icefall) part of the descent. You can just make our our switchbacks below. 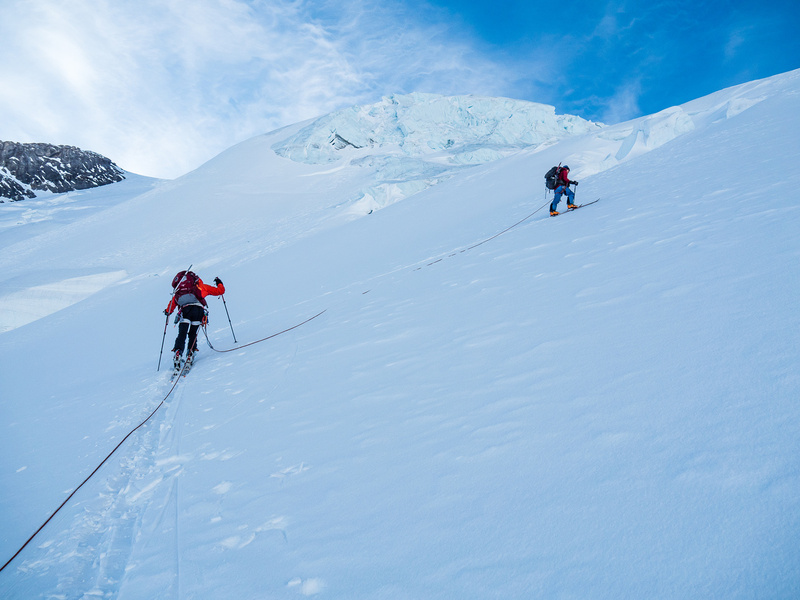 Mike follows Ben onto the lower icefield. You can see the large avalanche below us here that originated in the Mousetrap and ran about 1km past it. 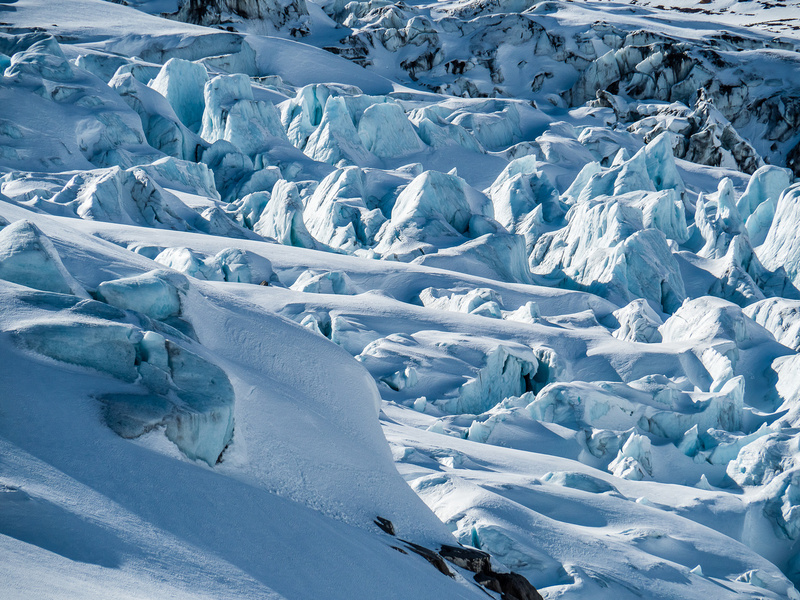 A beautiful world of snow, rock and ice. The Mousetrap at left with The Dome, Kain Face, Robson Cirque and Robson to the right of it. Our ski tracks through the ramp showing our avoidance of crevasses nicely thanks to Ben's GPS track from two week previous. Looking back from near camp, Resplendent at far left and Ben at center, just visible in the extremely bright conditions. Ben and Mike ski down the final section of glacier as I watch from camp. The glacial tarn at the toe of the Robson Glacier didn’t look too inviting in the hot sun so we avoided it on the right hand shoreline. Mumm and Anne-Alice visible ahead and looking big again. 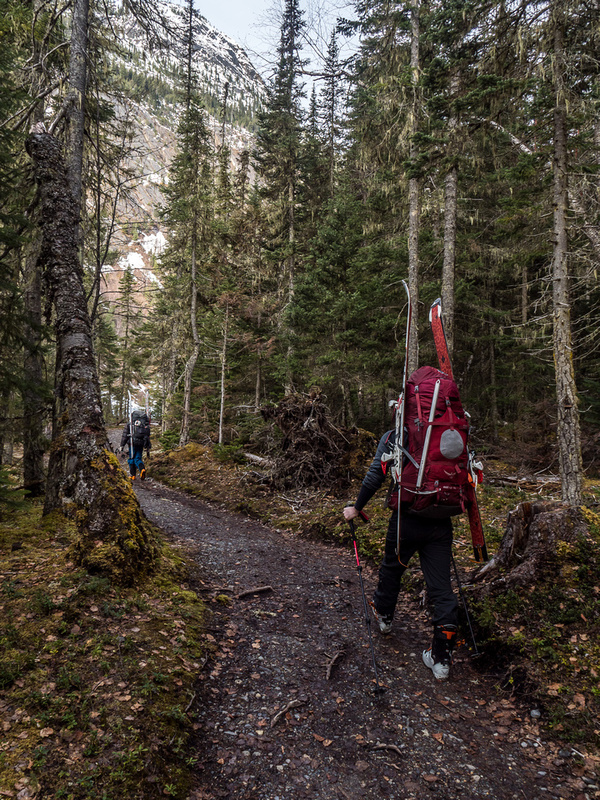 Skiing through a rain forest has its disadvantages. There’s not a lot of snow. Total stats for the trip (including an ascent of Rearguard Mountain) were roughly 71.5 kilometers distance with over 4100 meters of total height gain over 4 days. Not a bad Spring outing, I’d say. 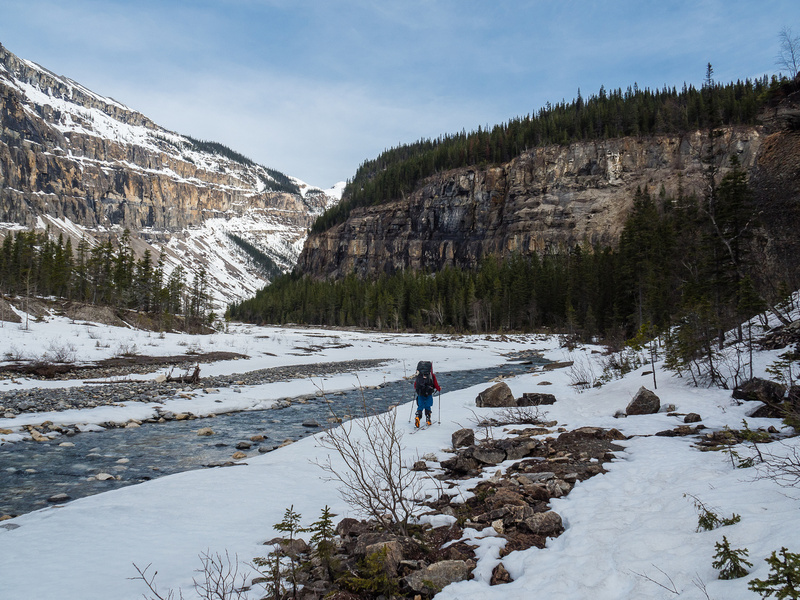 This trip is very highly recommended for fit parties who have a weird penchant for spring Rockies ‘skiing’ that may or may not involve actual snow but is guaranteed to provide lots of good times with friends and great views in clear weather. 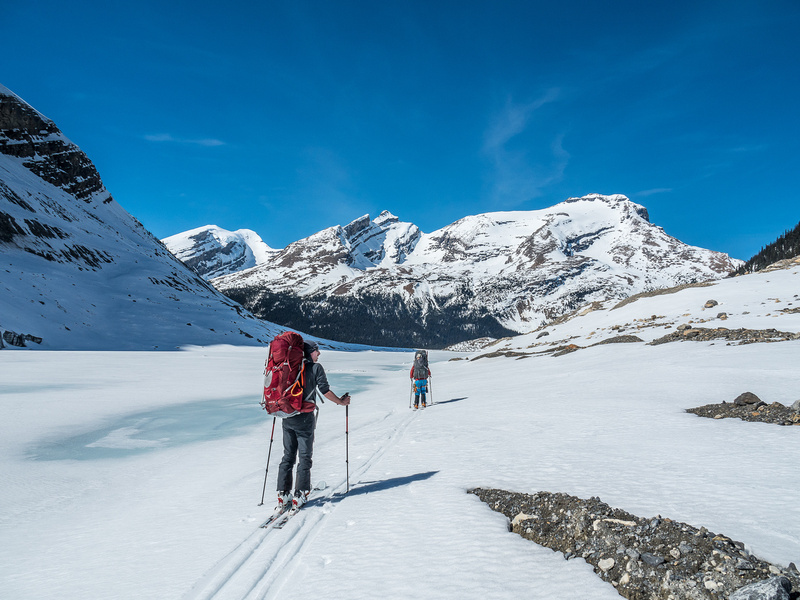 Thankfully the slopes below camp were still frozen and supportive, making the ski off the Robson Glacier pretty quick and easy. Rearguard at left and Titkana at right. The Snowbird Pass trail runs up the obvious moraine crest at right. The glacial tarn at the toe of the Robson Glacier didn't look too inviting in the hot sun so we avoided it on the right hand shoreline. A last look back at the Robson Glacier and Resplendent (upper right). Extinguisher Tower at center. 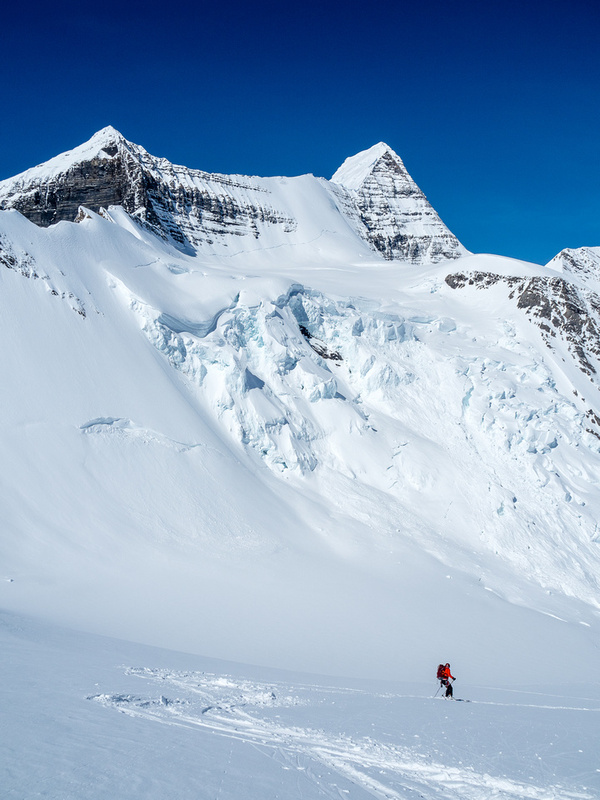 Ben skis down the drainage towards Berg Lake with Whitehorn rising dramatically above him. Dying light on Waffl, The Helmet and Robson from the Berg Lake shore. A look back over Berg Lake as we exit the area. 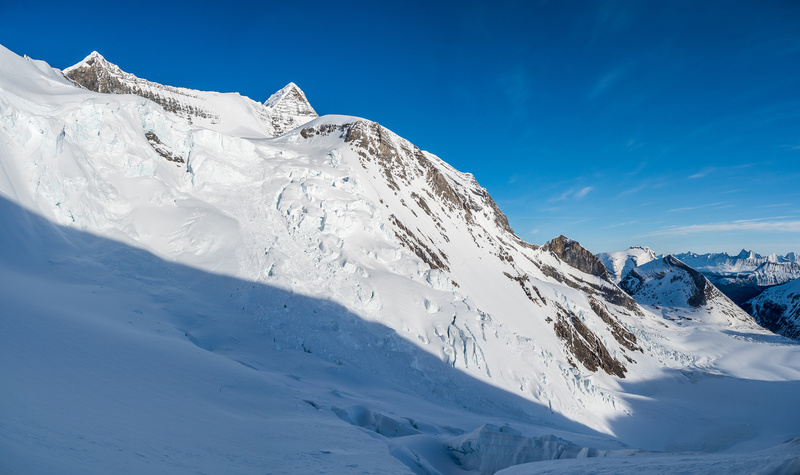 From R to L, Robson, Mist Glacier, Helmet, Waffl, Berg Glacier, Rearguard and Titkana. A gorgeous morning as we exit the Berg Lake flats alongside the Robson River with Whitehorn above. Falls of the Pool is always a nice diversion while ascending or descending the Emperor Hill. Cinnamon Peak rising in the distance and the Whitehorn Ranger station somewhere ahead on the Robson River flats below. My favorite section of the trail to Berg Lake is the Emperor Hill section. It's also the most work! Descending the Whitehorn Hill towards Kinney Lake at left. 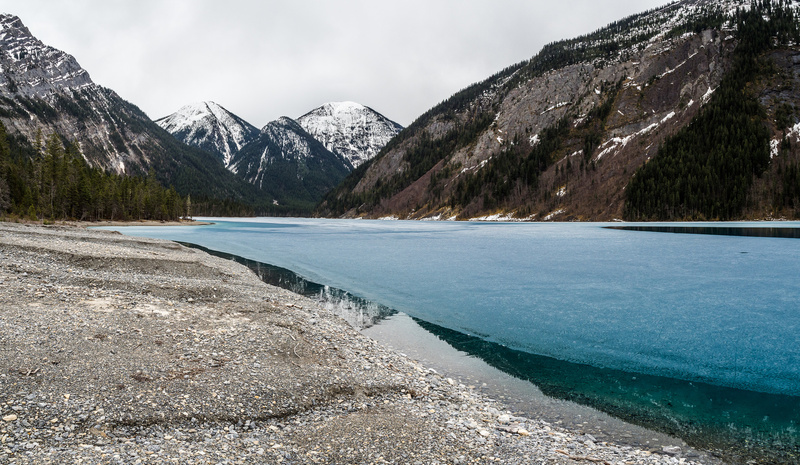 Kinney Lake is starting to look really thin now! 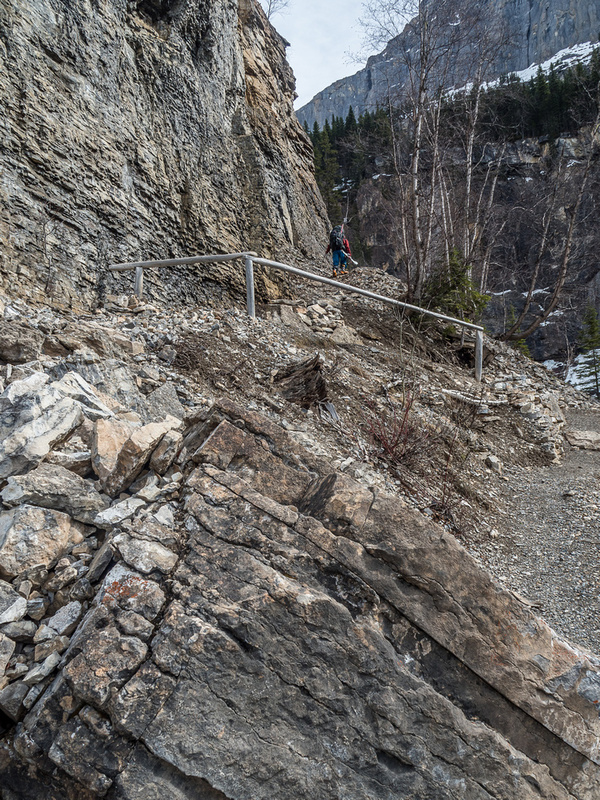 The trail alongside Kinney Lake is bone dry now. Back amongst the huge cedars that are actually not supposed to exist this far west. Thanks to Robson generating so much moisture, they love it here!